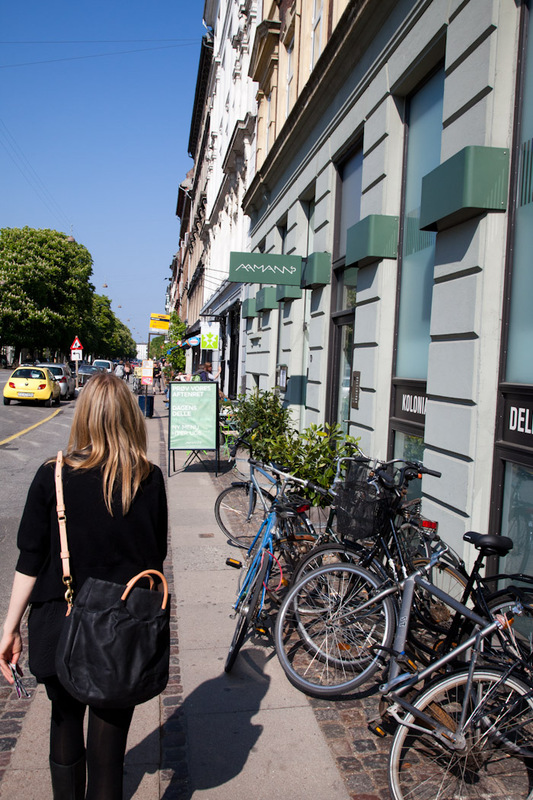 We arrived in Stockholm and everything is sunny and warm. We stayed at the Scandic Malmem hotel in Södermalm, the hotel itself was great, it’s clean, modern and in the perfect location. 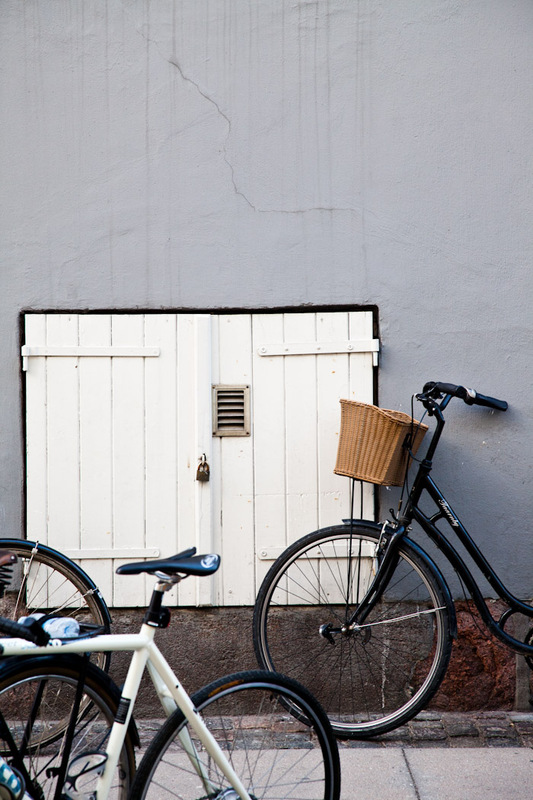 On a trip to Stockholm you could spend most of your time exploring Södermalm. 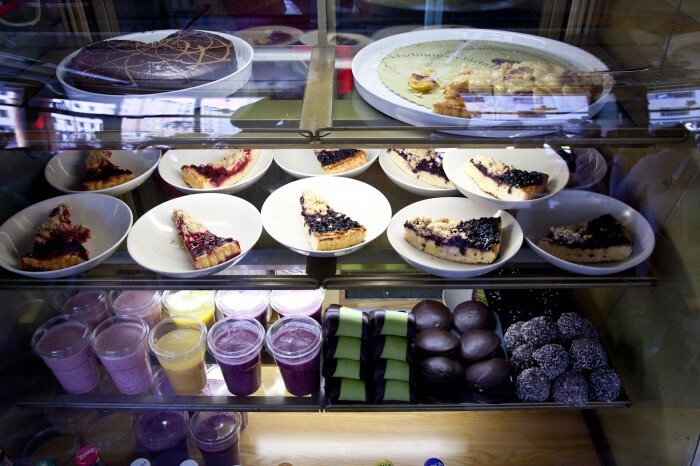 There are countless cafes, boutiques, and some good eating as well. 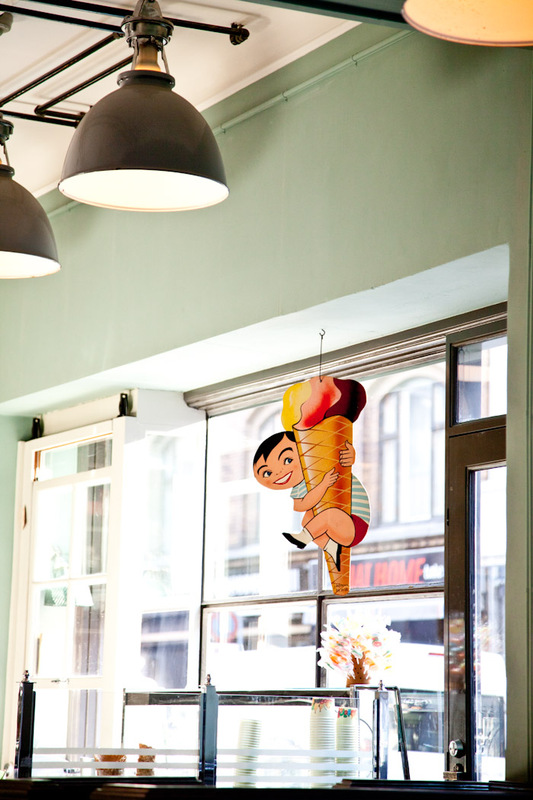 On our first day we visited String Cafe, a busy retro cafe that was packed for their weekend breakfast buffet. 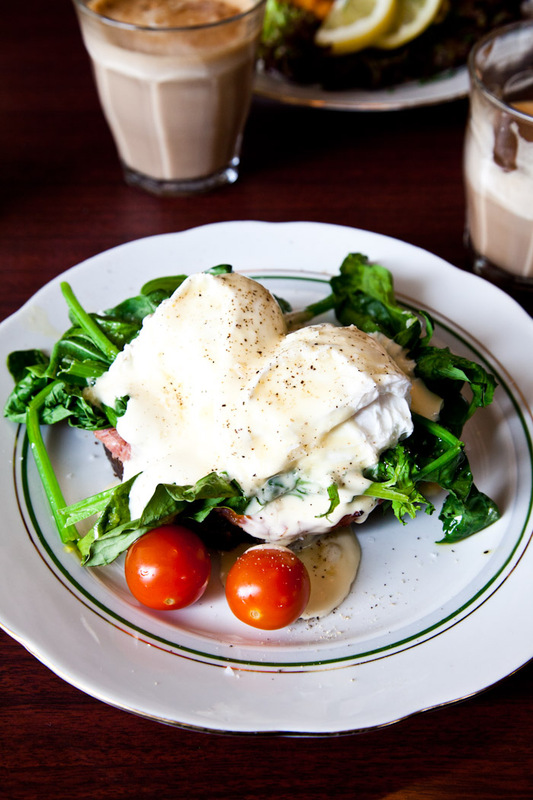 If you’re hungry on the weekend and want to find some good breakfast this is a really good pick. 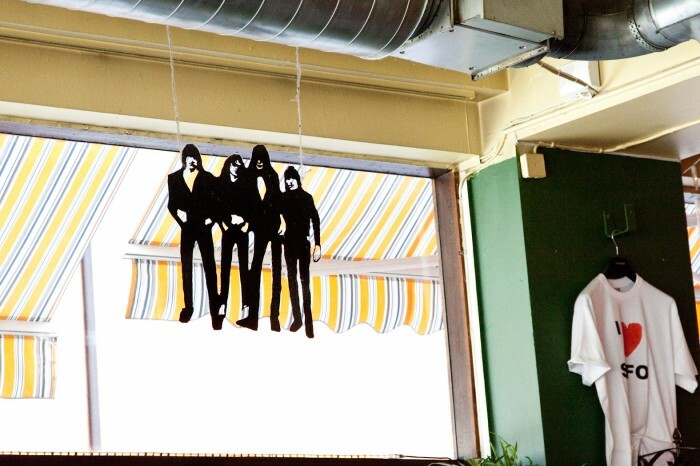 The Ramones hang in the window near an I heart SOFO t-shirt. 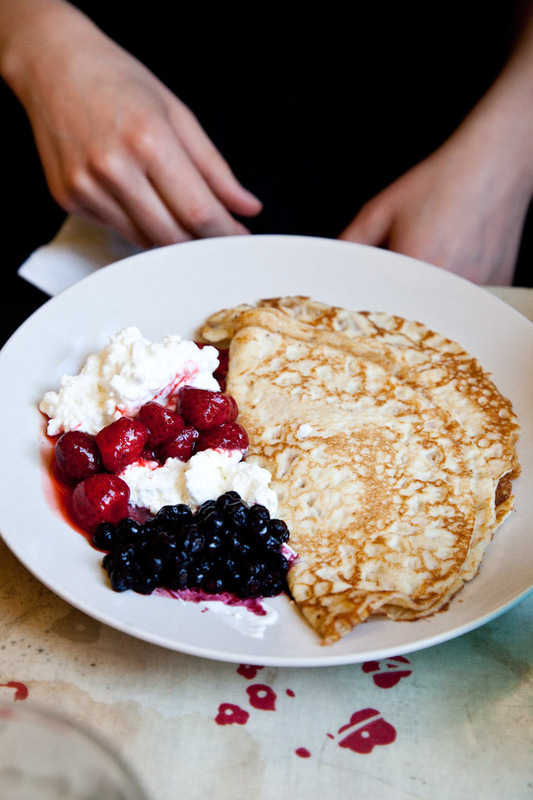 There was also a little crepe station with a generous mix of berries and creme fraiche. On any other day of the week you can stop in and order a cafe latte and help yourself to one of these delicious looking baked goods. After breakfast we walked over to a couple of shops in the neighborhood. This one is called Grandpa. From what we remember it used to be more vintage but now it has a lot of great new brands, similar to RAC in Yorkville. A couple doors down is a cool record / vintage shop called “An Ideal For Living” There was a bowl full of vintage leather “FIAT” key chains that were pretty cool. 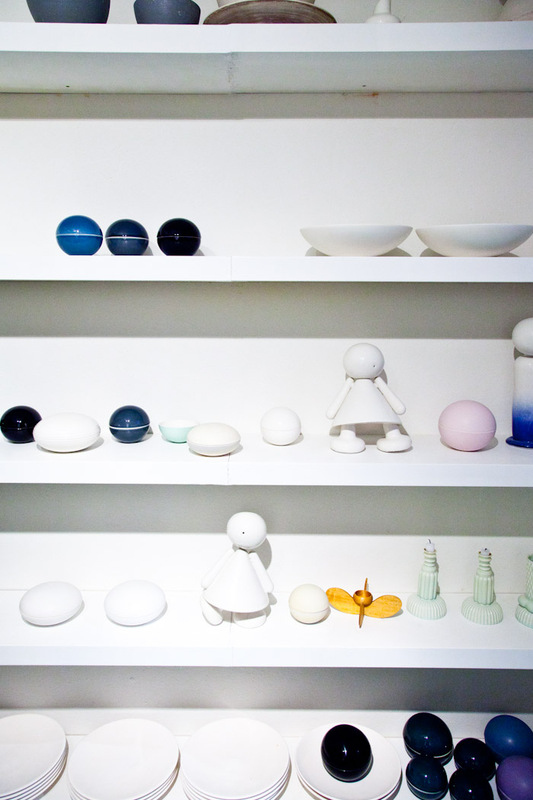 They also had a collection of Stig Lindberg pottery, and Moomin books. 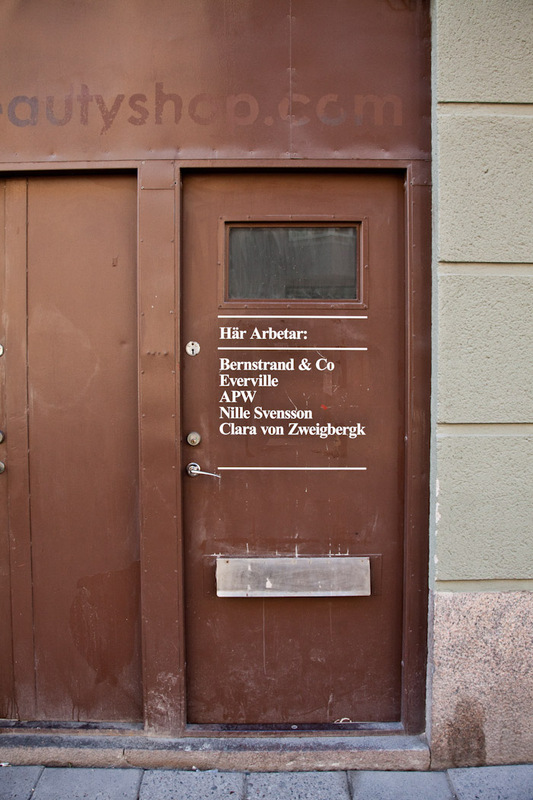 We spent most of our day walking around Södermalm and happened upon Thomas Bernstrand’s studio. We totally creeped his window and he spotted us peering in, I bravely gave him a wave and he opened the door for us. 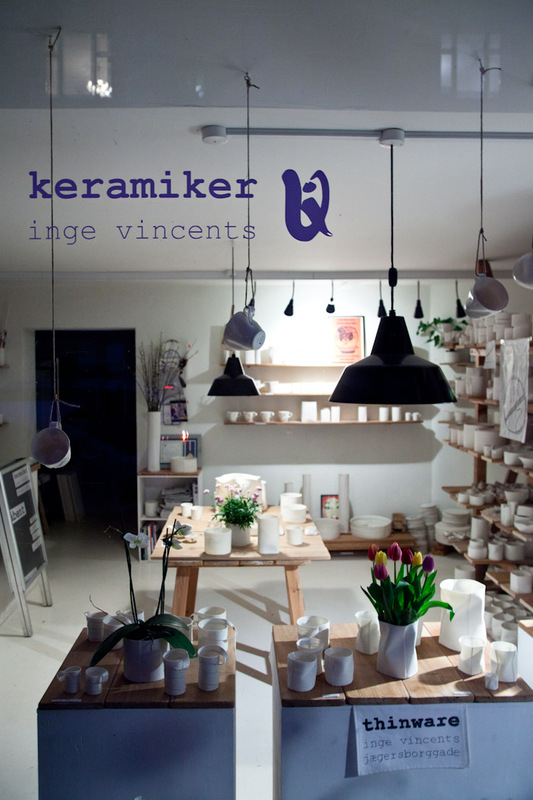 We gave him a card and told him about the store and he graciously offered to take us on a tour of his studio. 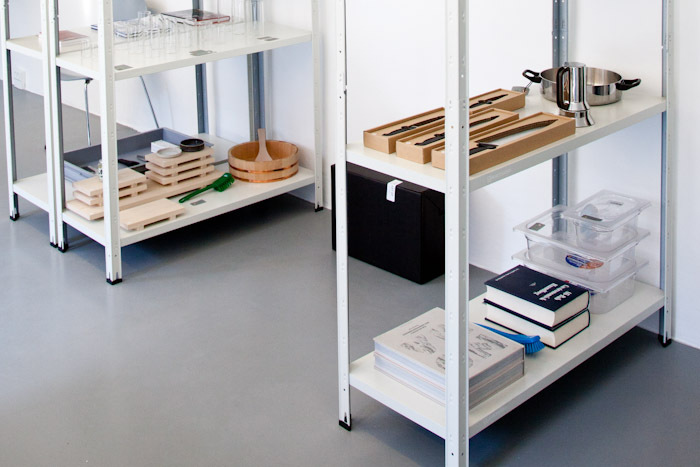 When you enter the space you get a feeling of what has been occupying him and his studio. 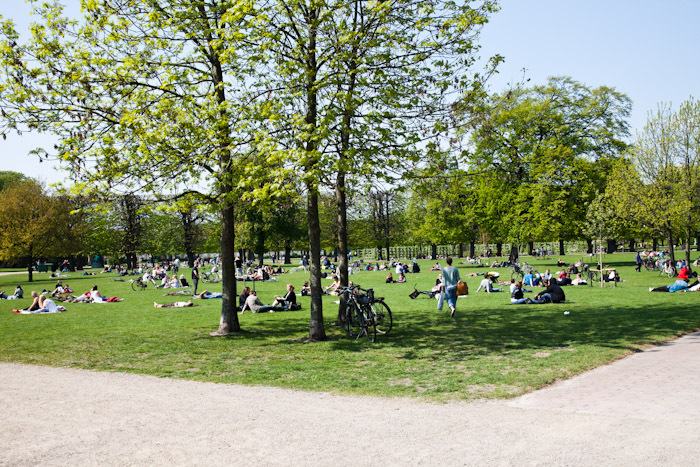 Public spaces, in fact he had the honor to design park spaces including a large installation in Rosenlundsparken. (More on that later) The concrete seat is called the “Gnone” and is also used to partition roads from parks. 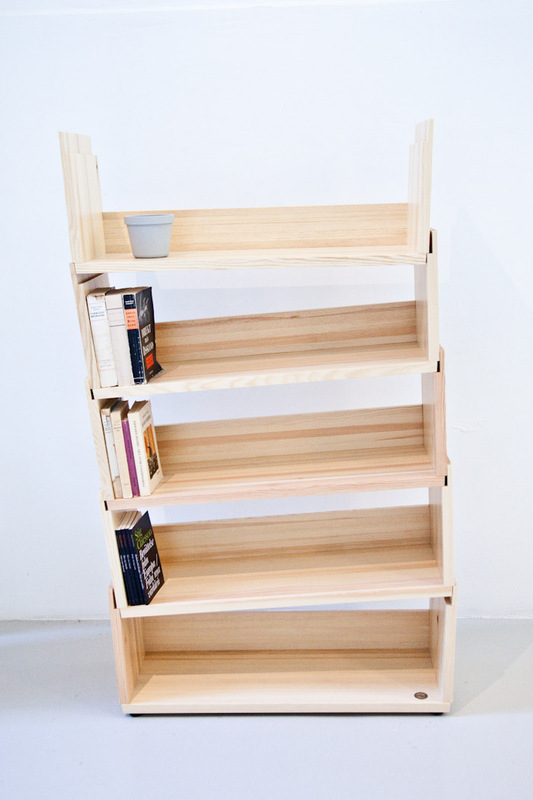 Something that I really wanted to see while in Stockholm was this piece, “Ivy” a stackable bookcase made from pine. I would love to put one in our own home. A wall mounted park bench called “Kajen mini”, it is used as a spot for a quick rest and is mounted higher than most seating so you can easily get back up when you’re done. 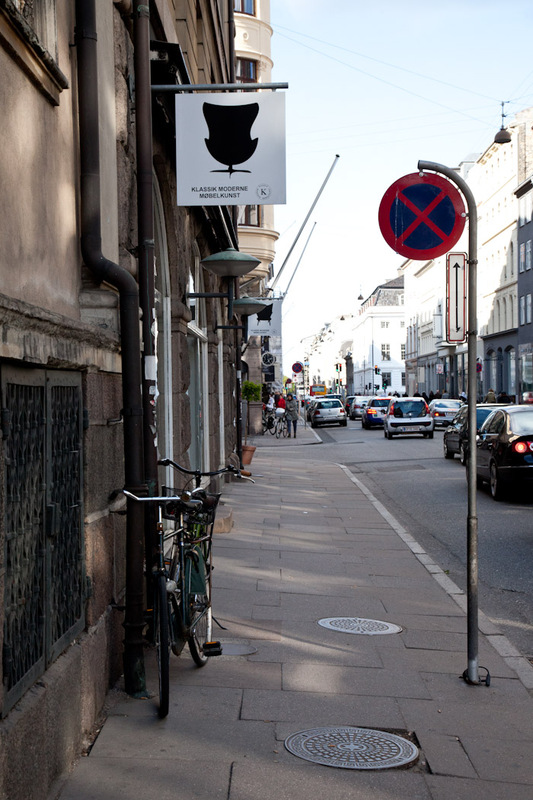 Thomas mentioned that these would be great all over the city, for tourists and elderly people who need to stop for quick rests. 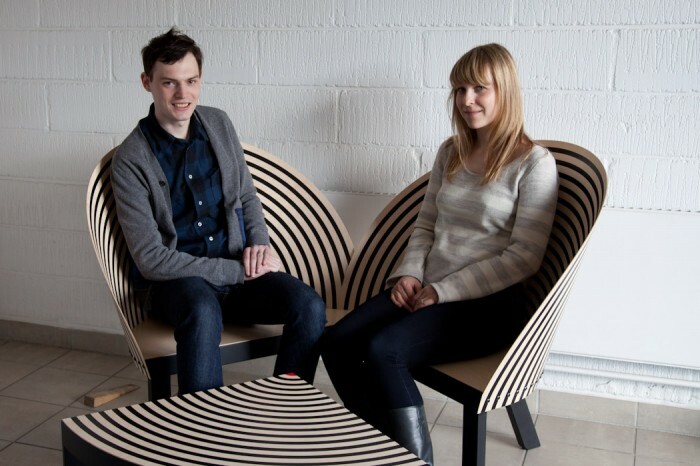 A pair of “Strand” chairs inspired by the classic beach chair. 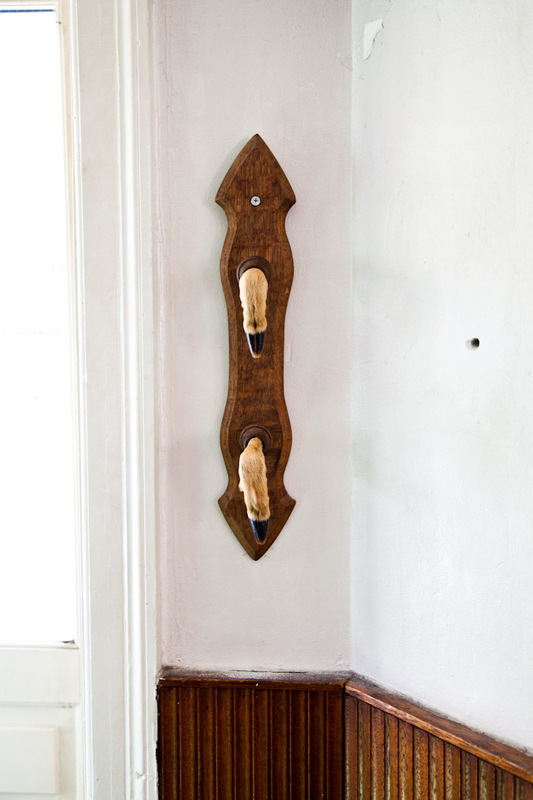 We fell in love with these log and magazine holders, I’d love to get some in for the shop. We were curious to see the outdoor spaces Thomas had designed so we got out our map and he marked where Rosenlundsparken park was, we had some time before dinner so we headed there. Here we are! 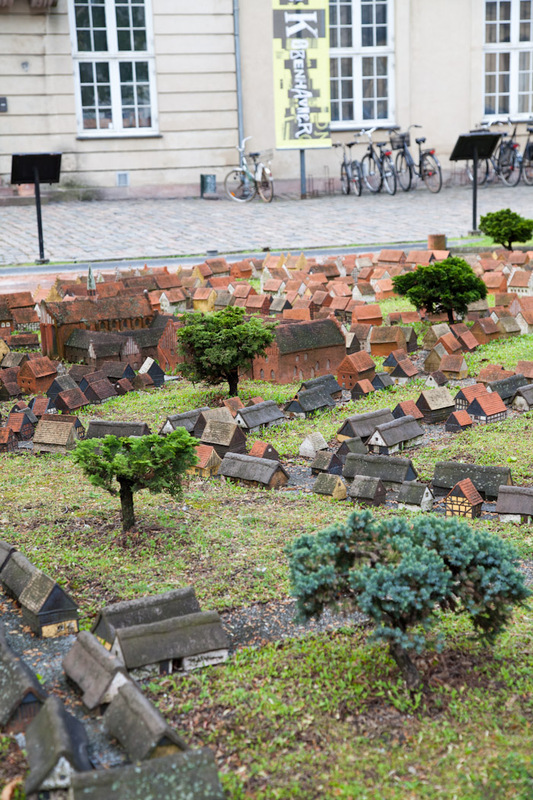 This installation is called “Stranden” which means the beach. 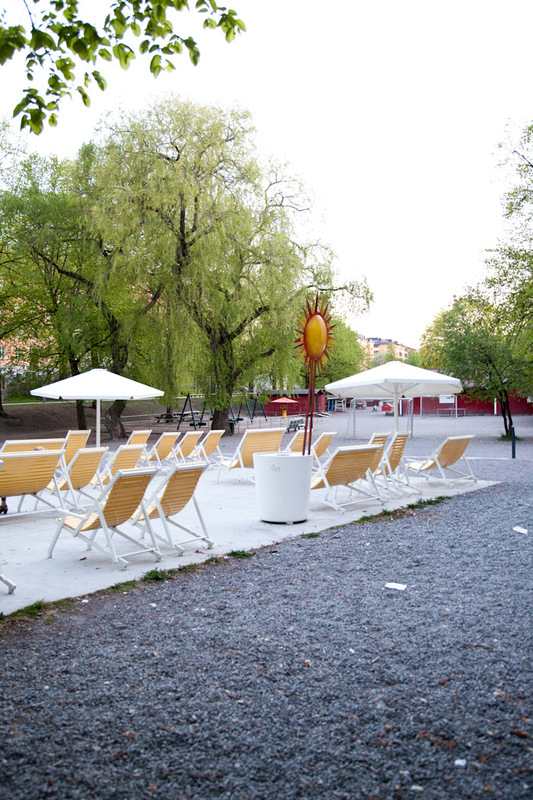 The park has a huge lamp outside that lights up at night and during the dark winter Stranden reminds the deep frozen Swedes of summer, and lazy days at the beach. 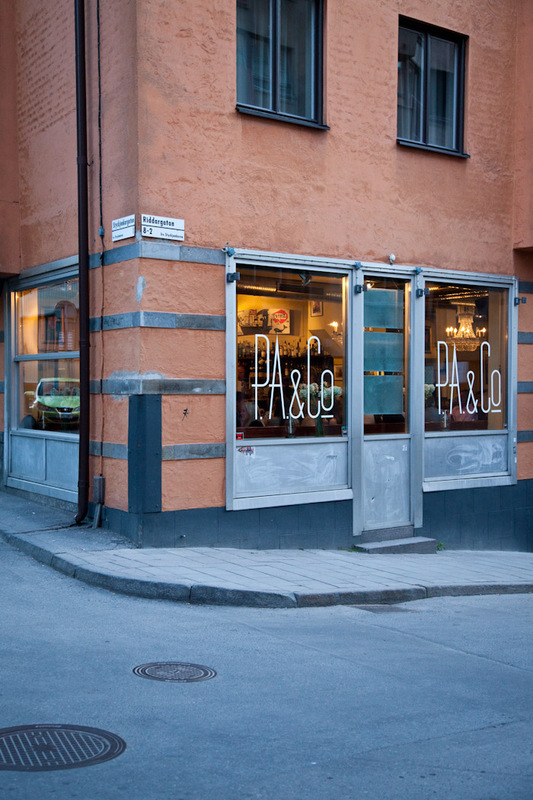 For dinner we headed to Östermalm to eat at PA & CO. Which is super cosy and popular, you definitely need a reservation to eat here, we saw people turned away at the door all night. The first thing we saw and ordered was the “S.O.S” platter. One of our favorite things in the world. 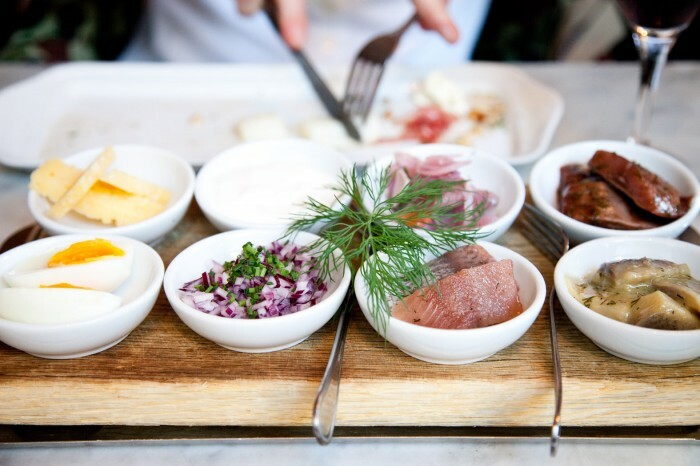 It comprises of different pickled herring paired with different toppings, our favorite of course being cheese and dill. One of the issues we had with this place was the menu. 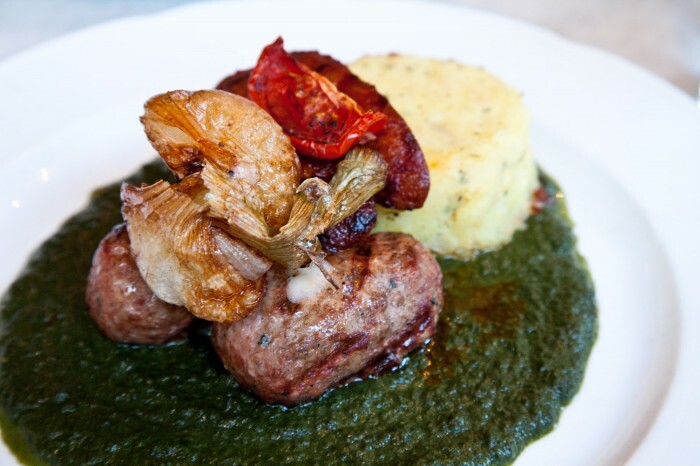 It was HUGE with dishes from Indian to Thai to traditional Swedish… We opted for the Swedish classics. Juli had meatballs which were delicious. I had the Beef Rydberg, which I wasn’t too crazy for. Maybe it was just an off night, looking back at the photo it looks really delicious but there was something off about the meat. 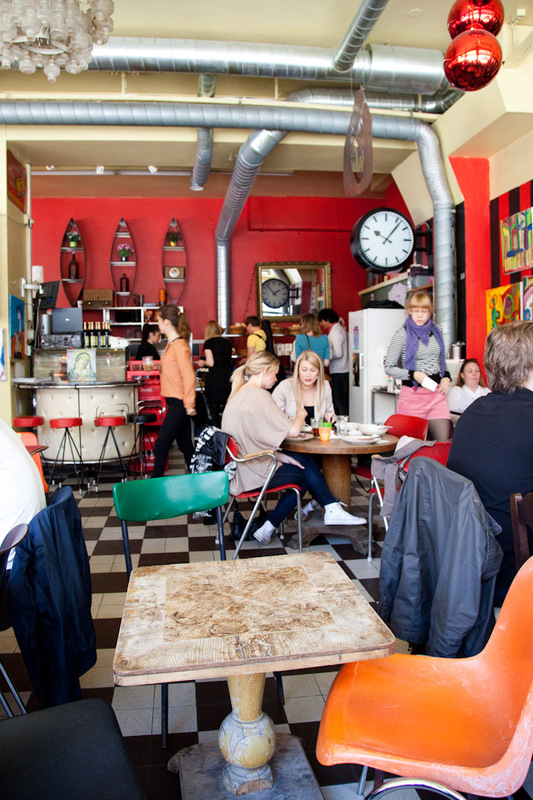 We started our day off right and headed over to the Vesterbro neighborhood to visit Cafe Bang og Jensen for some breakfast. 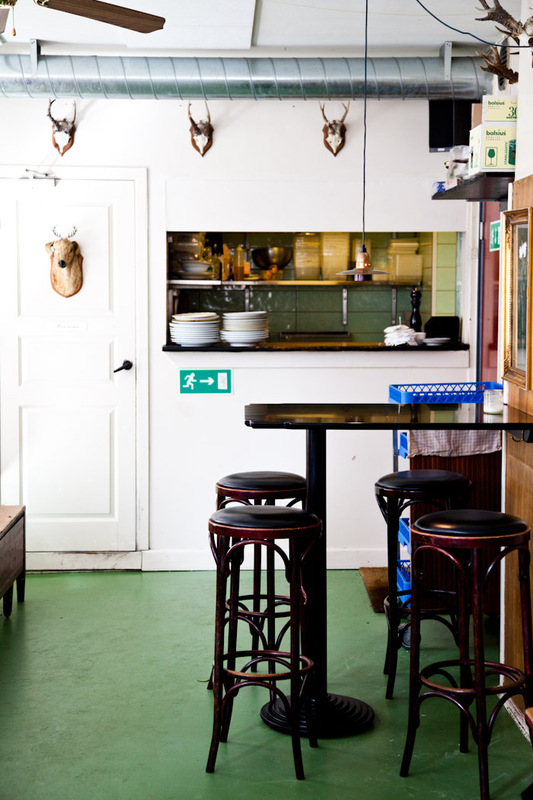 This is easily one of the favorite spots for a morning meal in Copenhagen, and they even offer a Smorgasbord from 8:00 – 10:30. We were a little late for the buffet and opted for the breakfast platter with soft boiled eggs. 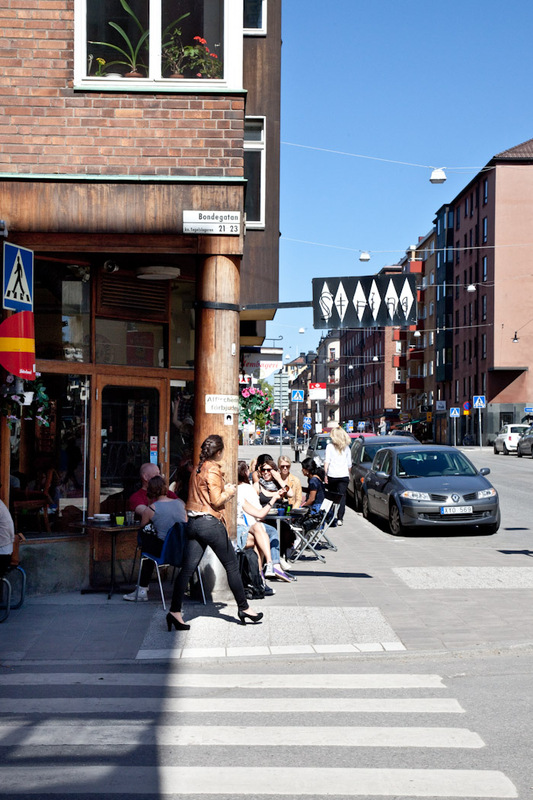 The cafe is a nice and modest spot with some great patio seating if you’re lucky enough to get a seat. 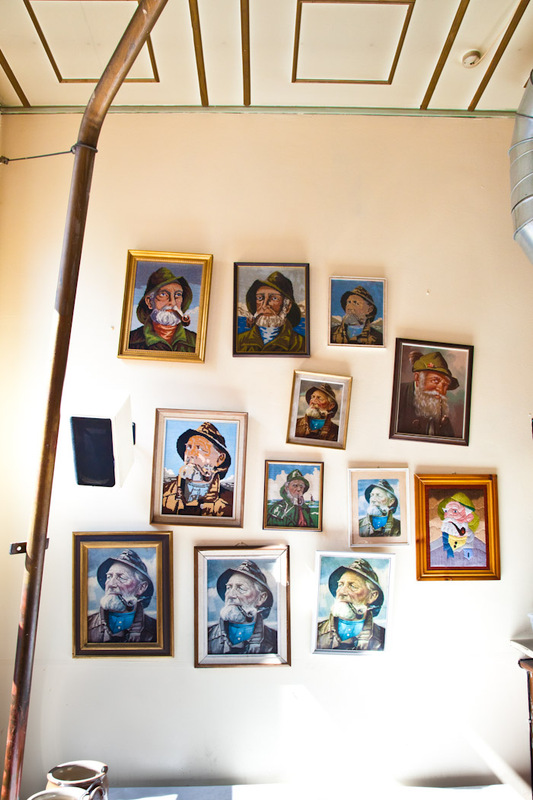 On the walls hang lots of “Old sailor” prints. 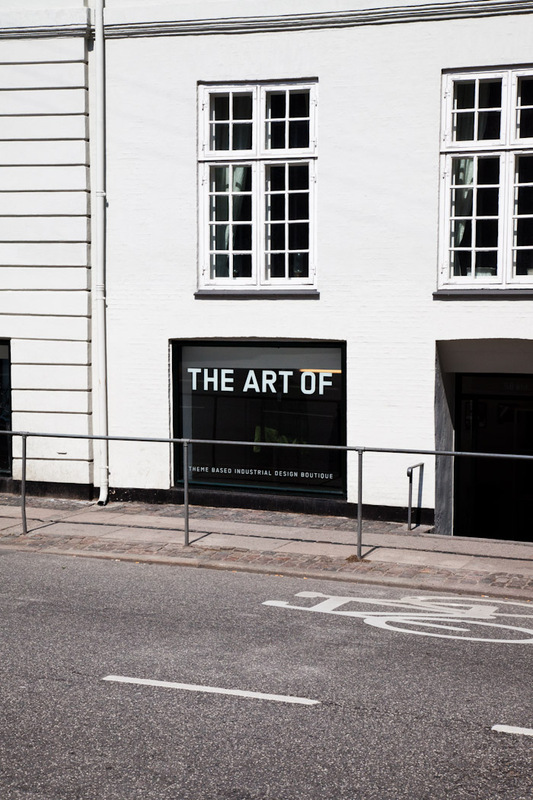 After breakfast we headed over to “The Art Of”, a brand new shop in Copenhagen and a store that I instantaneously connected with and admired the second I walked in the front door. 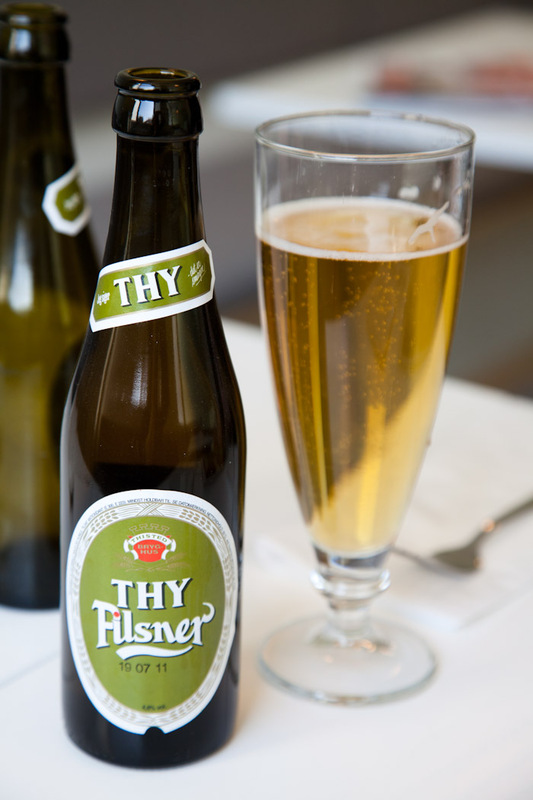 It was randomly recommended to us by a fellow diner at Relæ the night before. 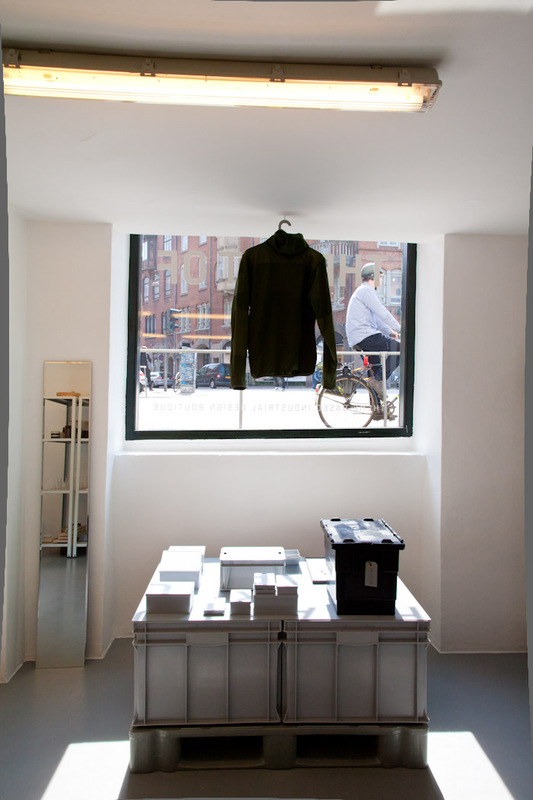 When you enter the store you see a curated collection of small products placed meticulously on grey industrial storage containers. 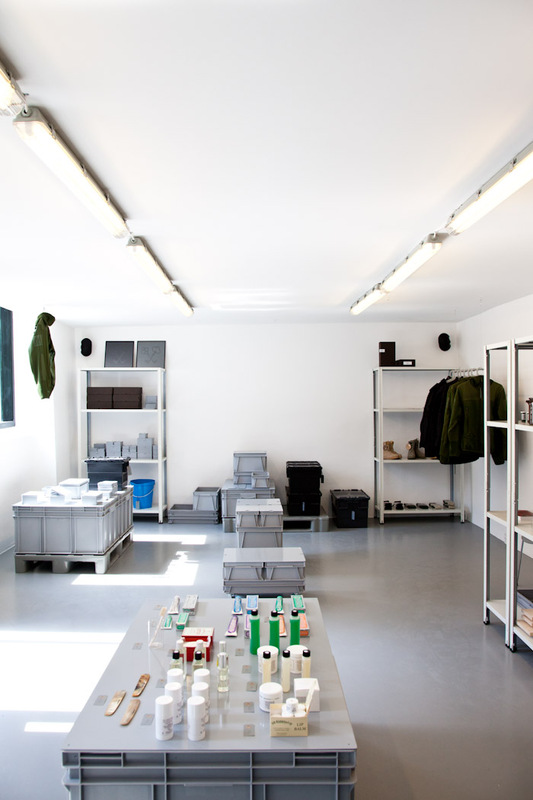 The products range from bull horn combs, Swedish Military knives, and German espresso makers but the collection of products all fit a central theme that is always changing. 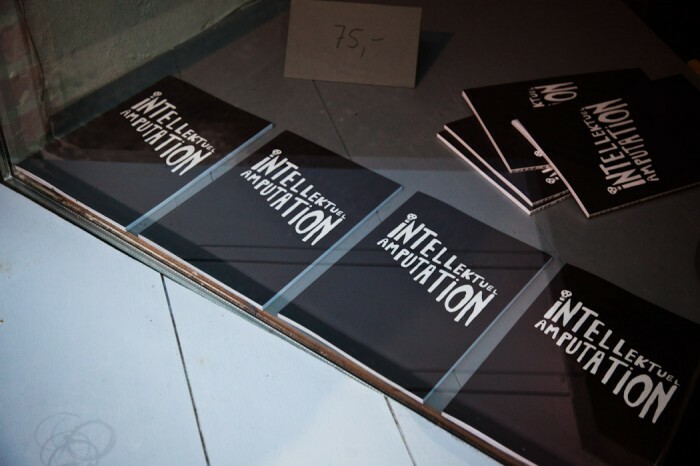 The current themes that were being explored in the space were The Art Of Cooking and The Art Of War. 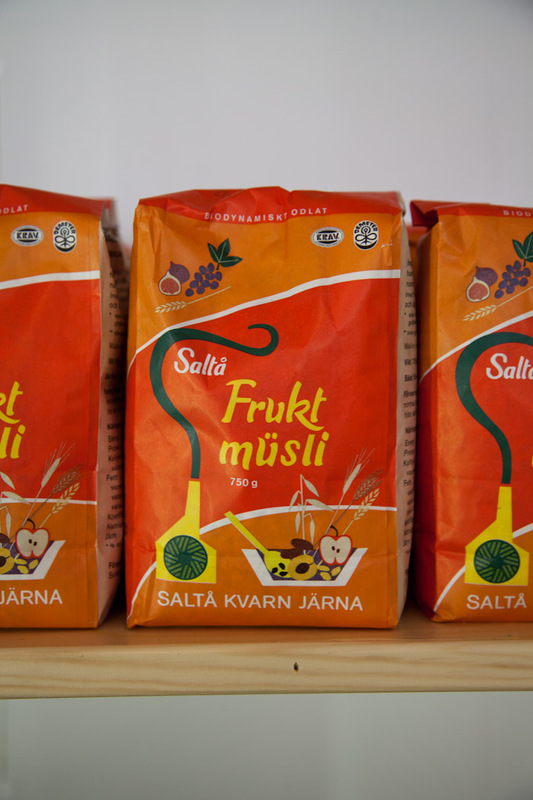 The owner Rasmus Barlby graciously told us amazing stories about many of the products he carries. 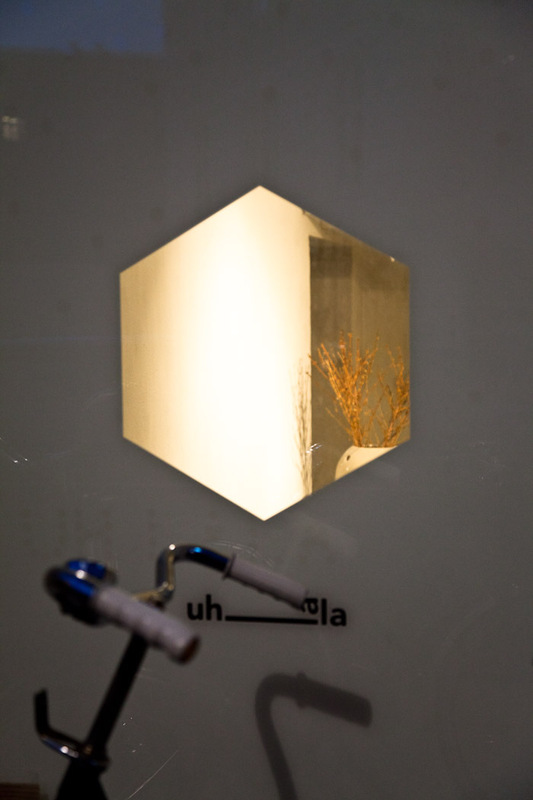 I think you’ll be hearing a lot about this store in the near future. 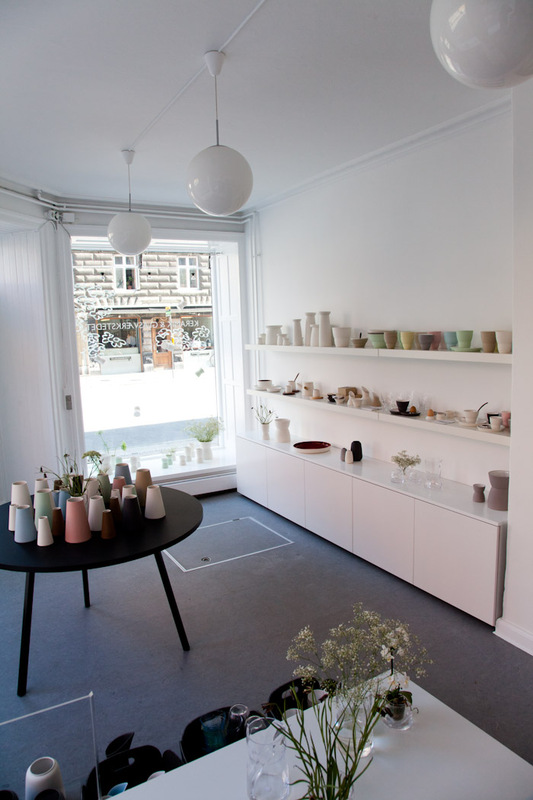 We took a walk to visit Keramik og Glasvaerkstedet, a studio / shop that features some of Denmark’s most prominent ceramicists and glass artists. 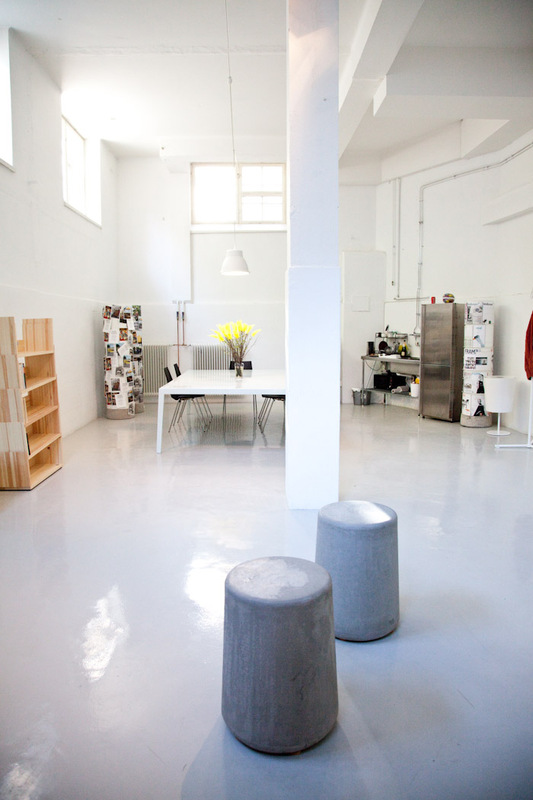 We were definitely on a mission this trip to bring in more from both of these mediums and after a bit of searching we finally found the beautiful corner studio. 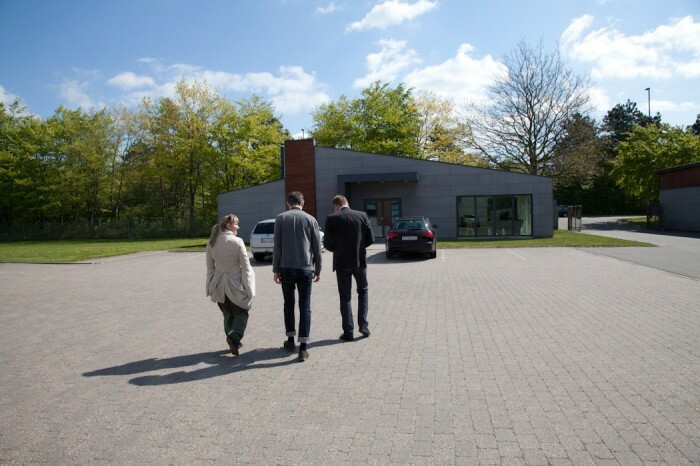 During our visit we met with artist Annemette Kissow. 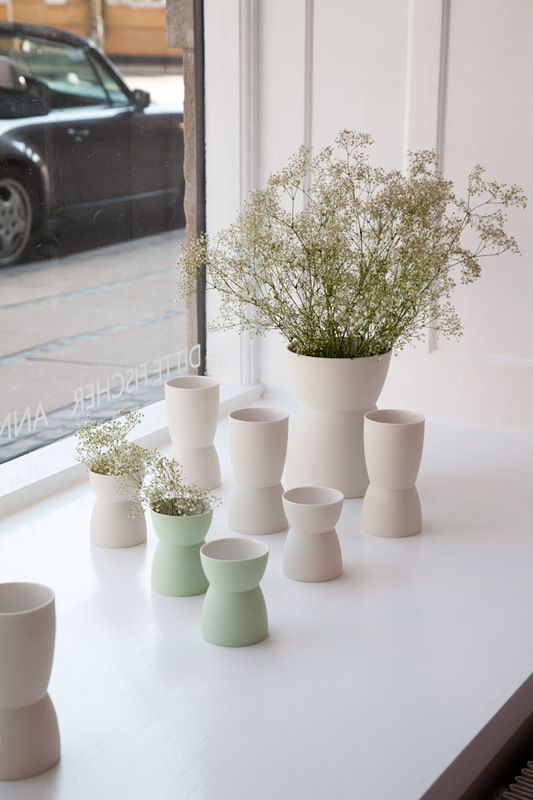 The studio had an exhibition featuring her beautiful flower vessels with sprigs of “baby’s breath”. 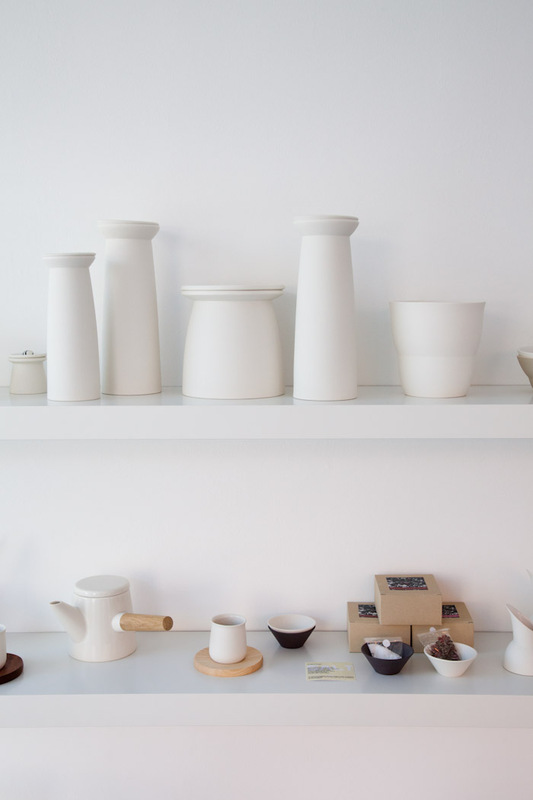 We really loved the matte white storage containers, salt and pepper bowls, and oak wood handle tea pot. A little peek into the studio. With a bit of help from Annemette we were pointed in the direction of our lunch destination. 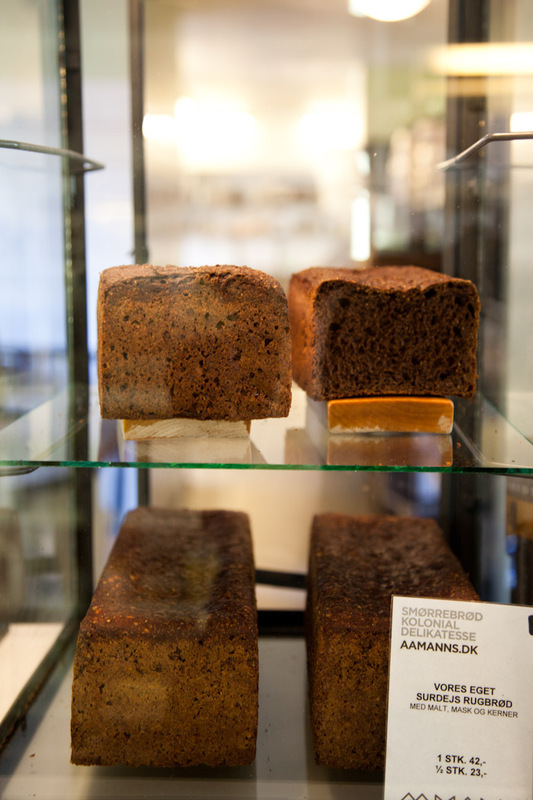 Aaman’s, arguably Copenhagen’s best destination for modern Smørrebrød. 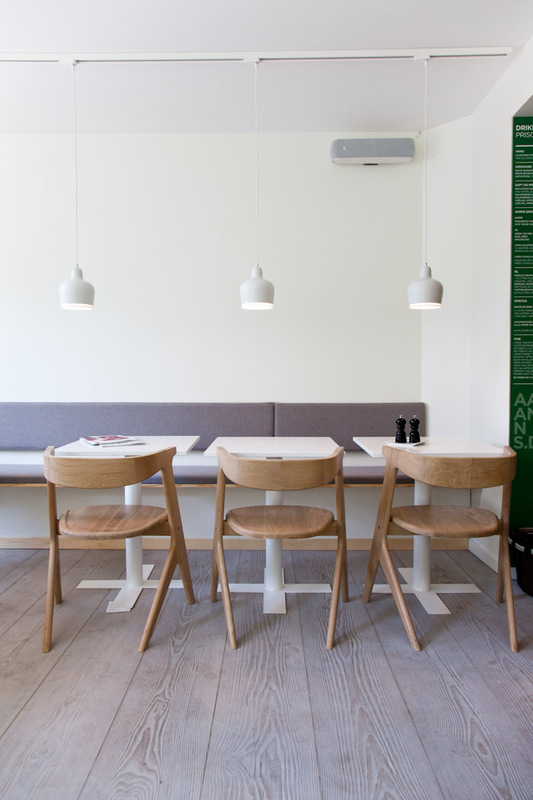 The restaurant was recently renovated with some beautiful wide plank douglas fir floors, Aalto pendant lights, and Tom Dixon chairs. They even have white oak Rocket Stools by Eero Aarnio. 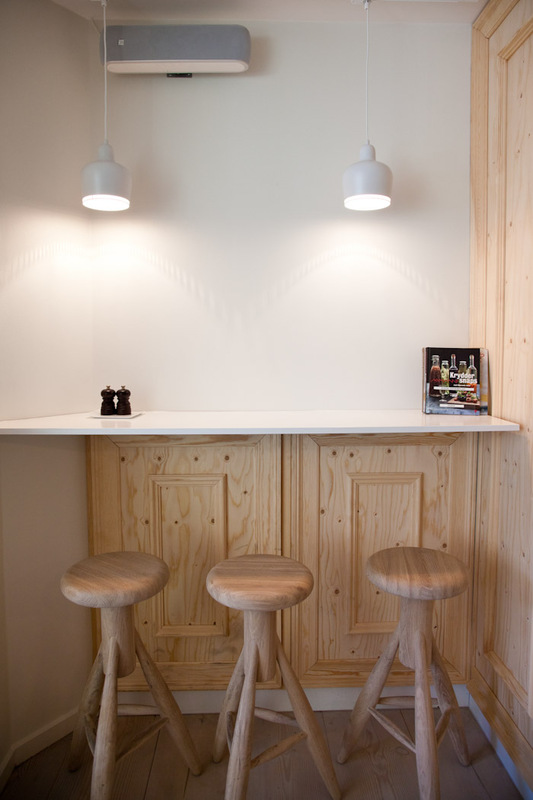 If you like this look you can get both the Rocket Stools and Aalto lights at Mjolk! 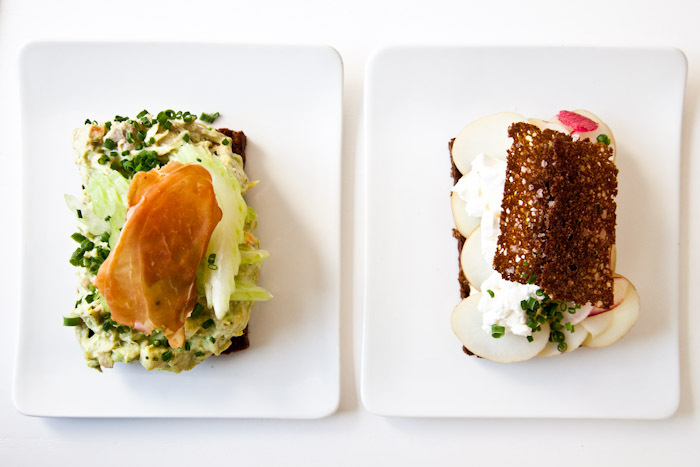 All of the smørrebrød are displayed with just the essential ingredients on them. 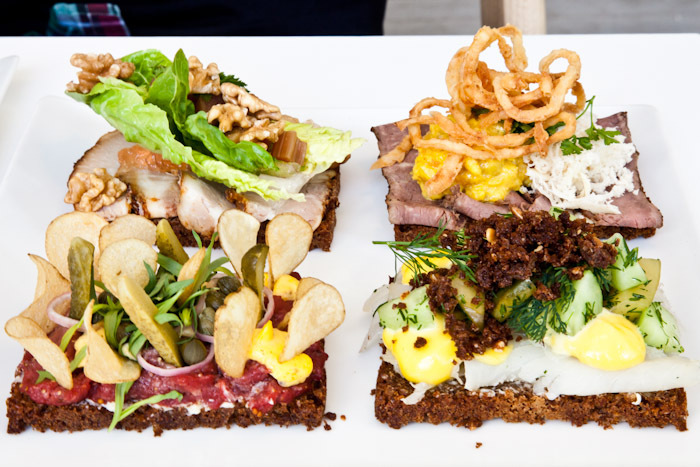 When you pick your smørrebrød they take it to the back and dress it up really beautifully. We ordered 4 to start and some beer. 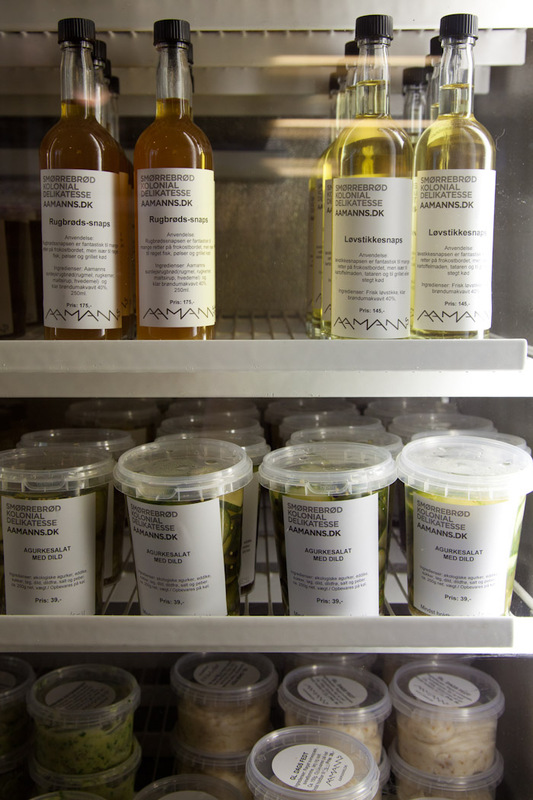 While we waited we checked out their stocked shelves and fridges full of ingredients and prepared take-away food. 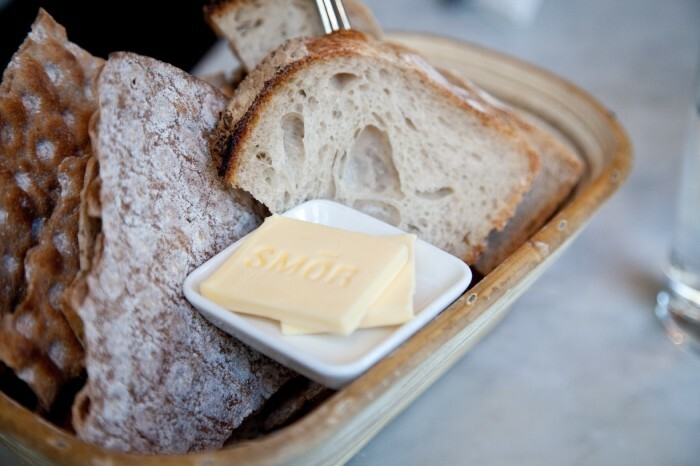 We sat down and our 4 smørrebrød arrived soon after. They were so delicious, easily one of the most enjoyable lunches we’ve ever had. 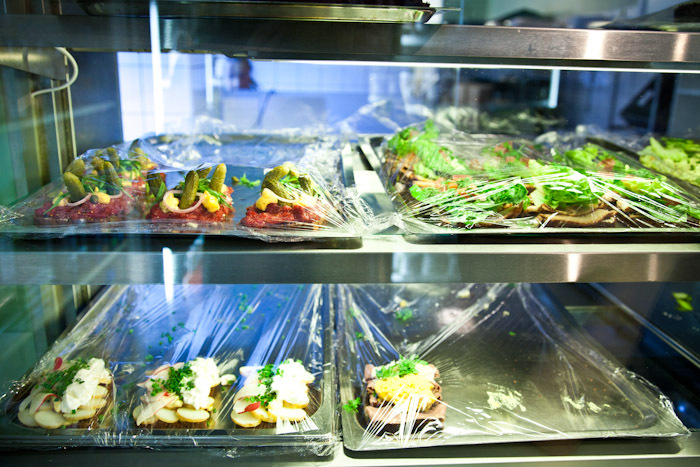 We decided that everything was so good we wanted to have the chance to try every single style so we ordered 2 more. 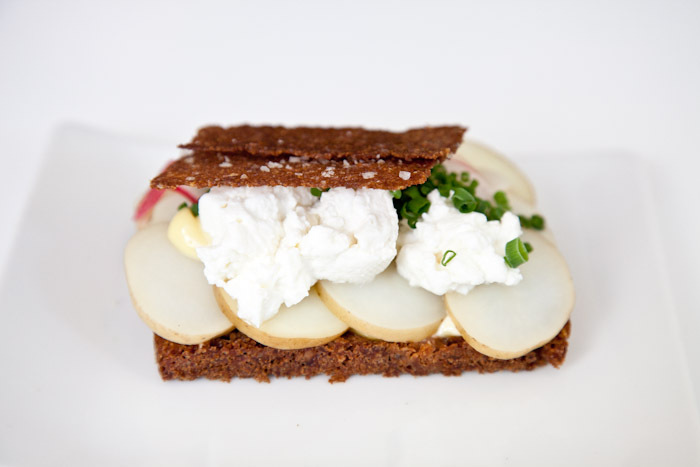 right: baby potatoes with cream cheese, chives and radish. 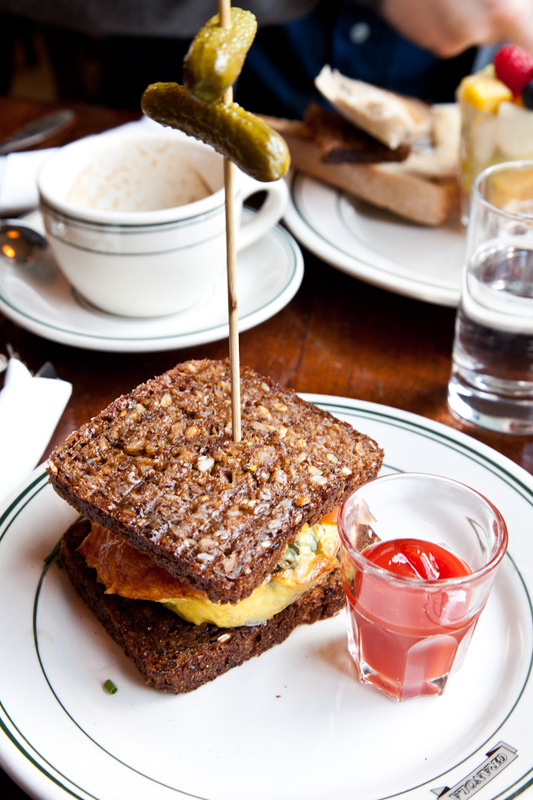 You may notice that there is always a “crunch” factor with every sandwich. 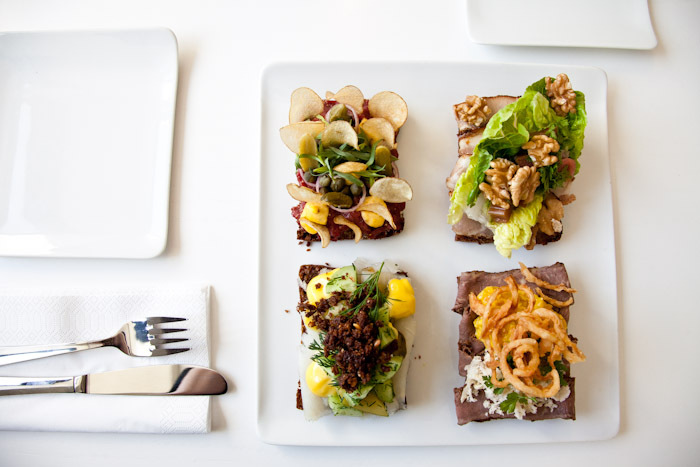 Texture is crucial in a good smørrebrød, you can get a bit of everything in one bite. 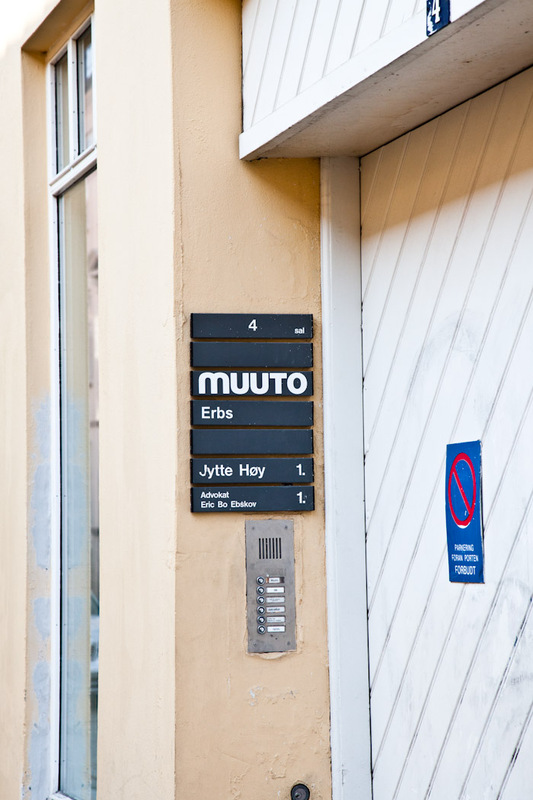 Looks like we stumbled across Muuto’s office. We didn’t buzz them (but maybe we should have considering the extreme delay on us getting our Dots shipment). 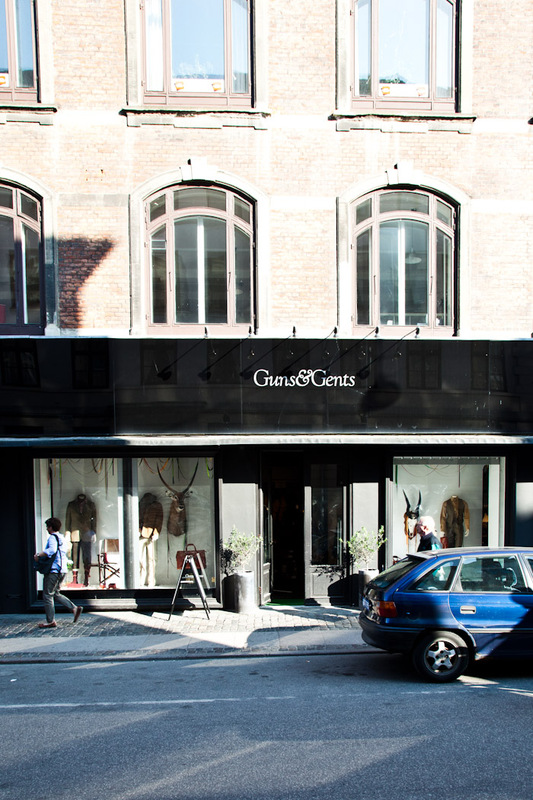 Guns & Gents, an interesting menswear concept in shop form. 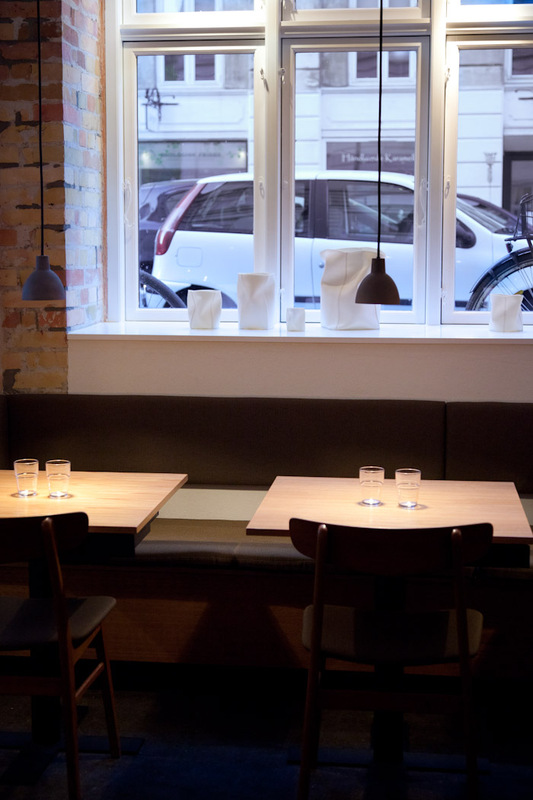 Our last meal in Copenhagen was Fiskenbaren, a new-ish restaurant that had been so hyped and talked about we made a point to get a 8:30 reservation on a Friday to make sure the place was packed and we could fully appreciate the Copenhagen bar/dinner experience. 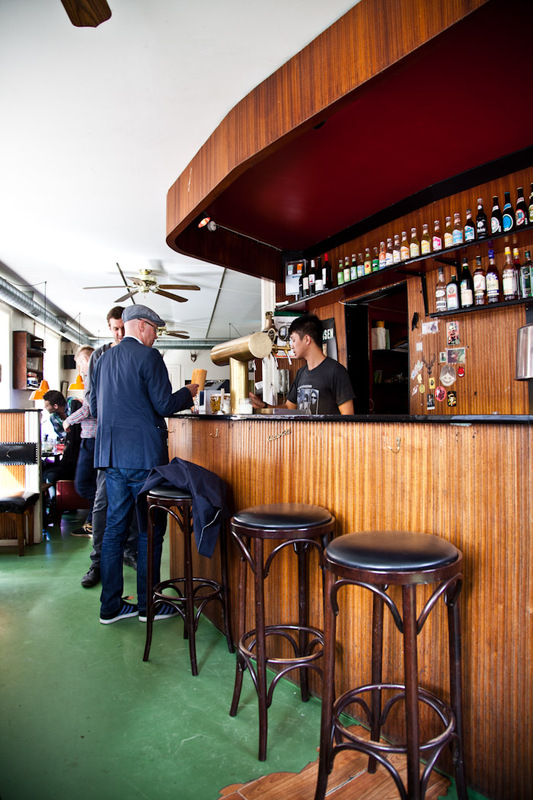 Tucked away in the meat packing district among some of Copenhagen’s most vibrant and interesting bars Fiskenbaren was once industrial space, and now has an award winning interior with a big fish tank and large square bar in the center of the restaurant. 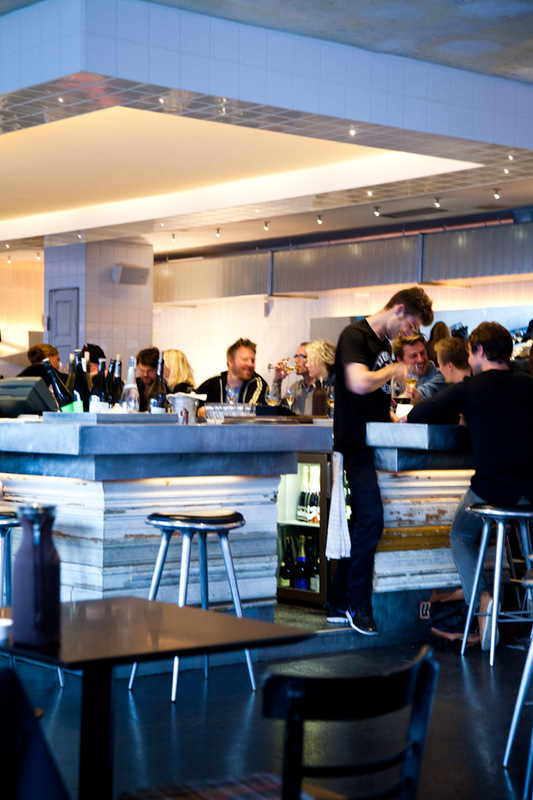 It’s lively and the place you want to be for a casual bite, or drink. 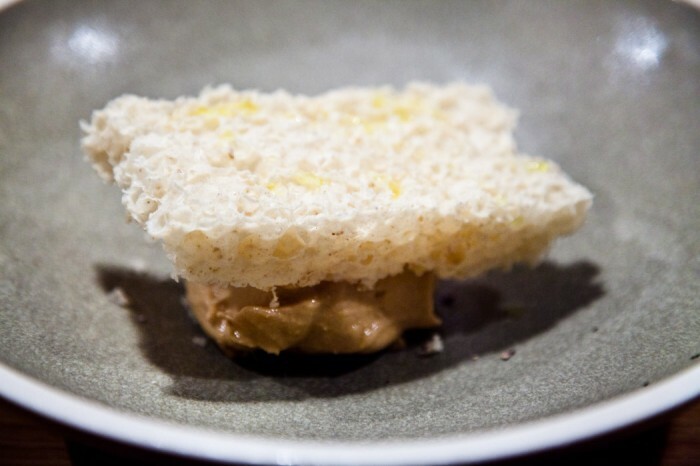 I have to admit however the dinner itself didn’t blow me away as much as the reviewers (from all sorts of prominent places) would have lead me to believe. Too much hype can just give you unrealistic expectations. 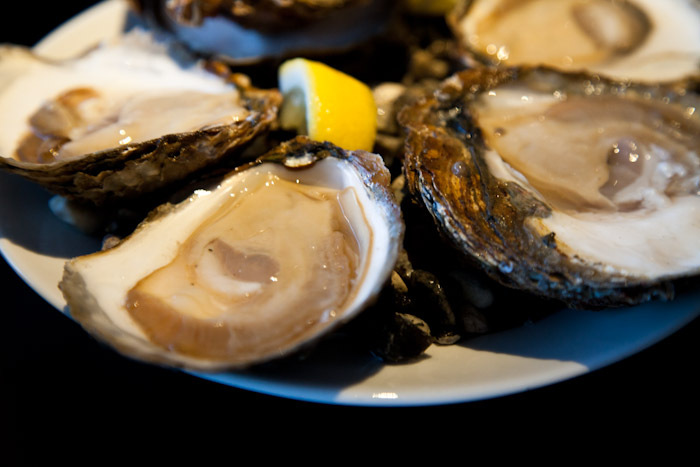 we started with Danish oysters which were large, fresh, and delicious a great start paired with Juli’s mojito and my gin and tonic. They do cocktails splendidly, although I have heard they have a great collection of wines as well. We decided to share our entrees so we could have a bit of range with the food. We had the butter cod and mussels. 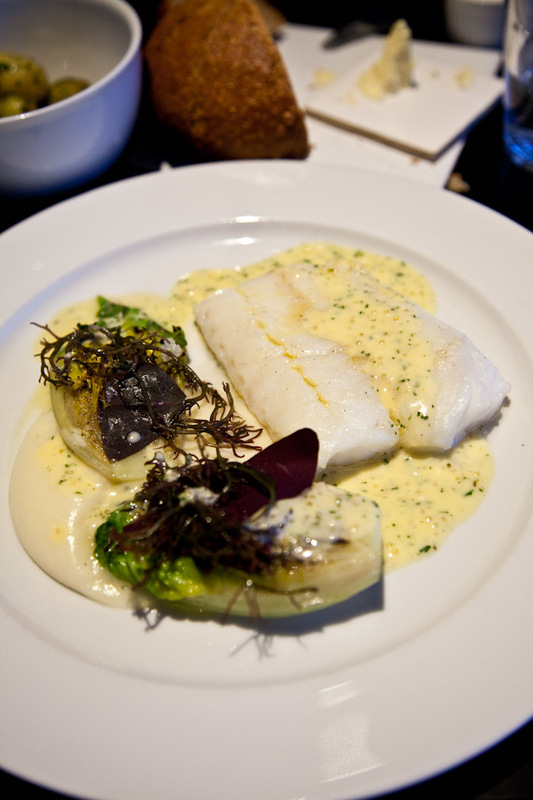 The cod on it’s own was fantastic, the butter and dill sauce was melt in your mouth delicious. The sides were very unappetizing, and had a taste of burnt lettuce and cigarettes, such a shame for such a delicious fish. 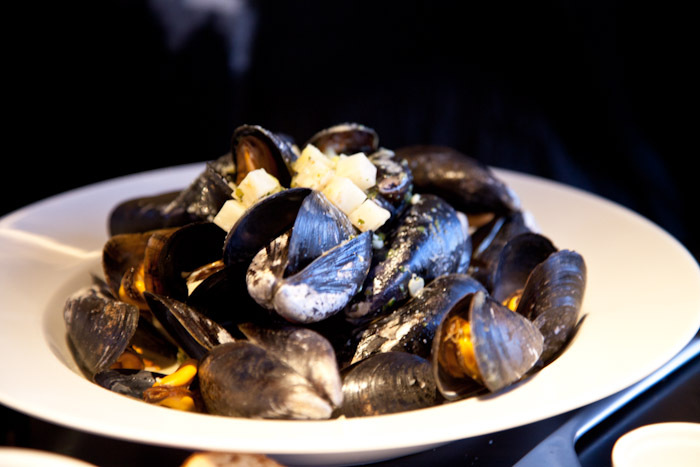 The mussels were good, it was served under cooked apples and bacon. 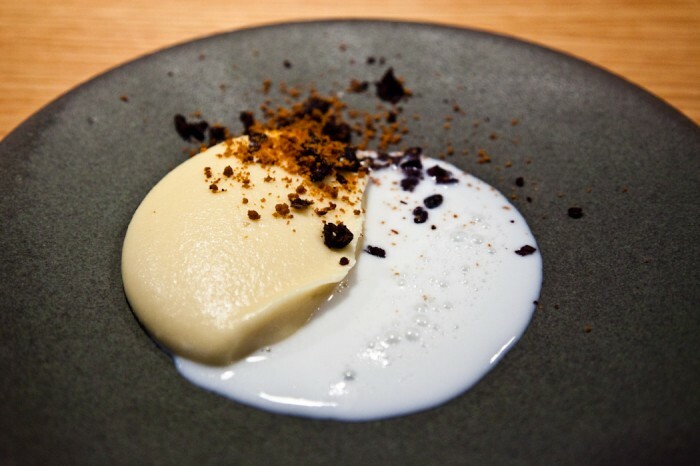 Although dinner didn’t leave a mark with us as much as Relae, I would still recommend Fiskenbaren. 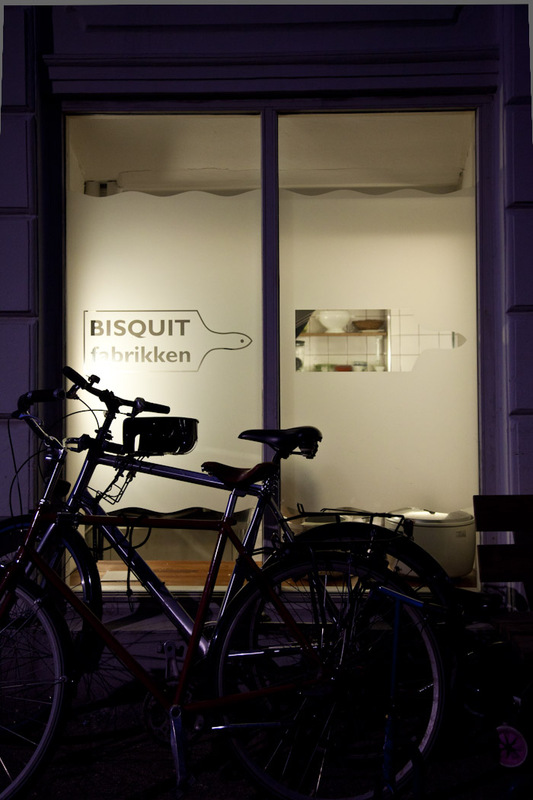 You get a glimpse of Copenhagen night life with some good eats, and the atmosphere is great. Plus you can always walk down the street and stop in at Jolene Bar it was crazy busy so much so that there was a guy taking a piss in front of it. 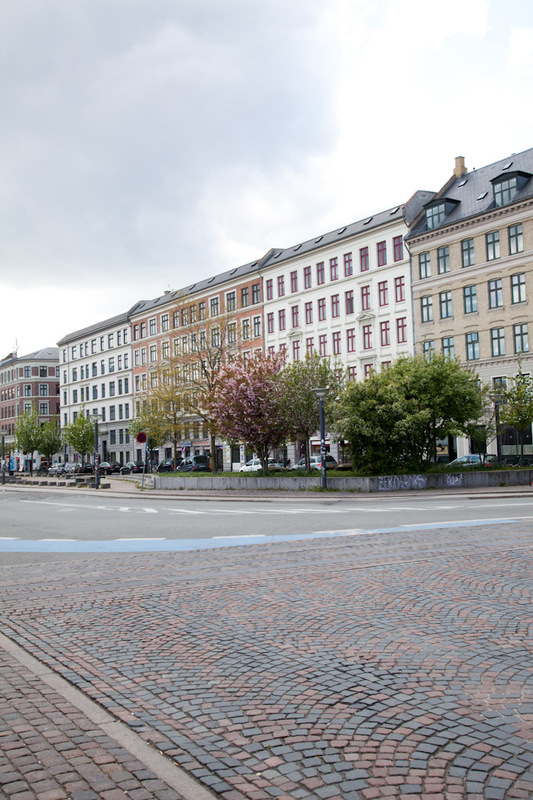 Not sure what is up with Copenhagen, if it’s always been looking so good, or if in the last two years they’ve been doing some extensive cleaning up, but it’s looking spiffy. 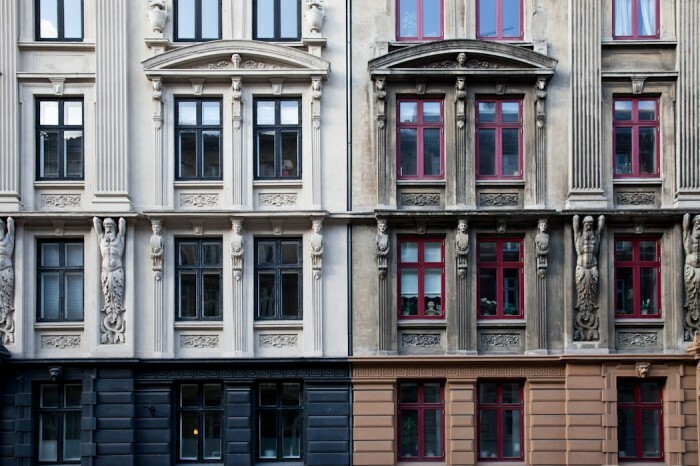 Buildings are clean and fresh with plaster (the above buildings as an example, the right one is currently being worked on). 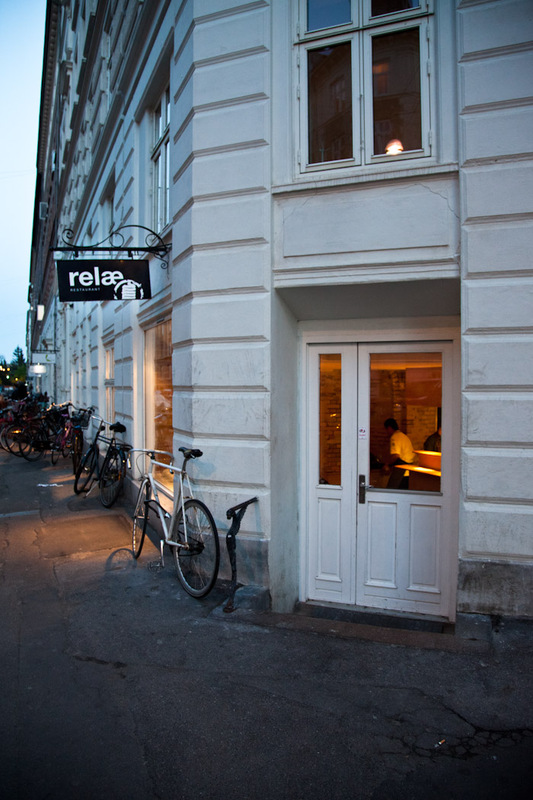 Our second night in Copenhagen brought us back to Jægersborggade, to Relæ which is kitty corner to last night’s visit to Manfred’s. 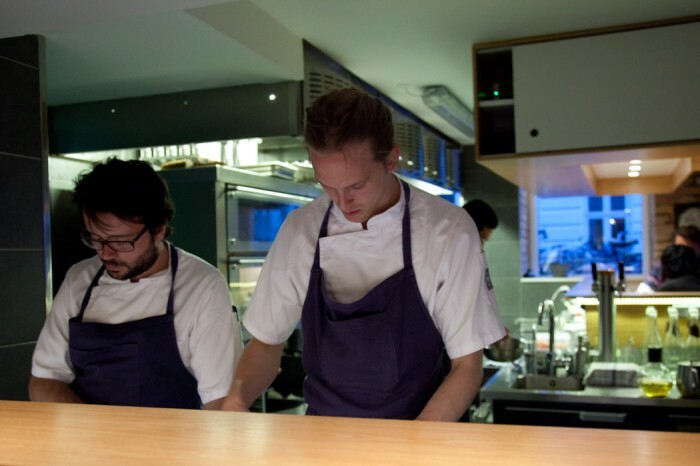 Both restaurants were opened by Noma alumni. We got a plum spot at the bar (we’re totally bar folk, we like to sit next to each other). An interesting group of Danes and North Americans (based on their accents, or lack thereof) working the kitchen. Each presented the dish they were working on to us. 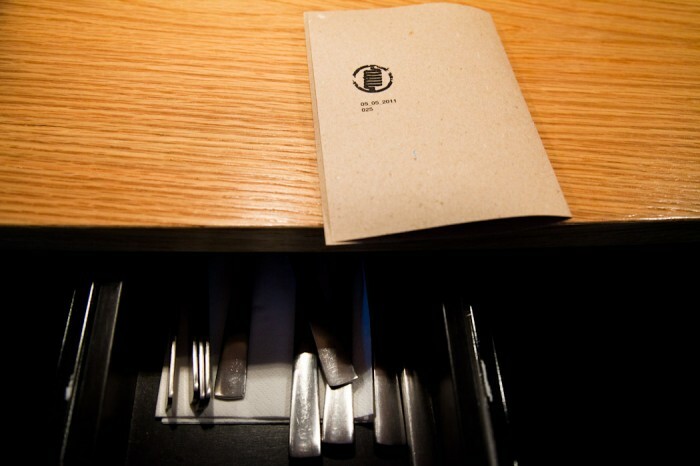 They have drawers at each table with the cutlery, napkins and menus tucked inside. 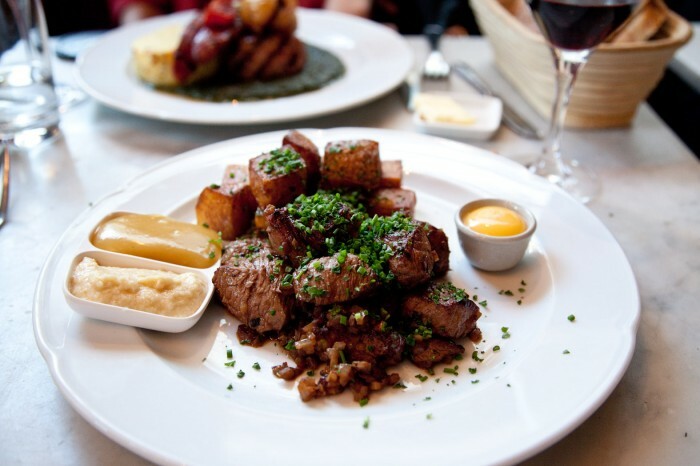 The menu has two options: regular and vegetarian, which is a variation of the regular menu. 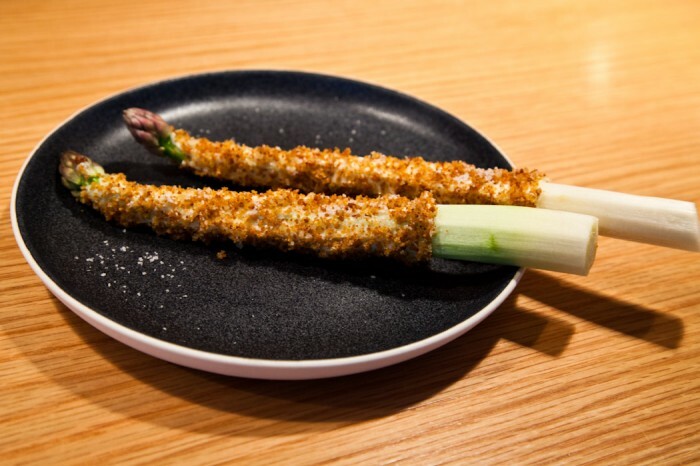 A starter, in season asparagus. 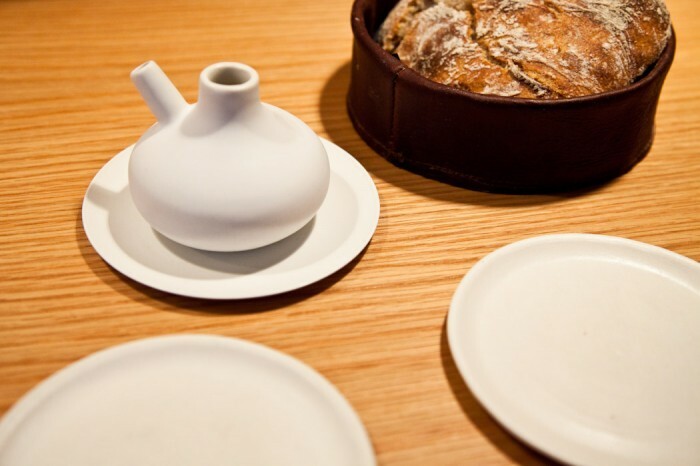 We loved the olive oil carafe and ceramics, which we found out later were all made by a ceramicist down the street! Local! 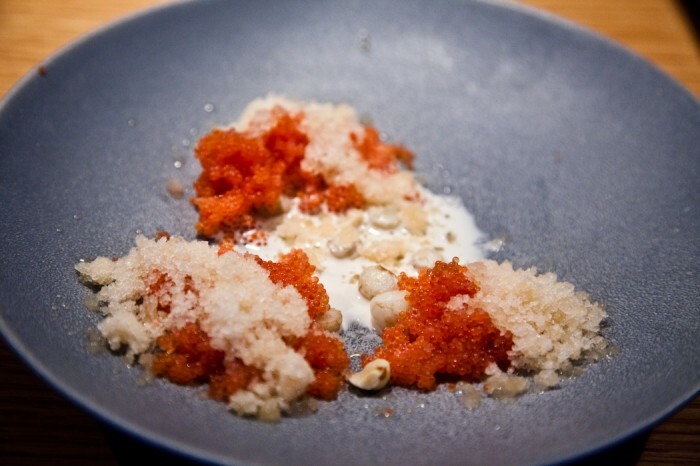 Lumpfish roe, hazelnut and cold grapefruit. 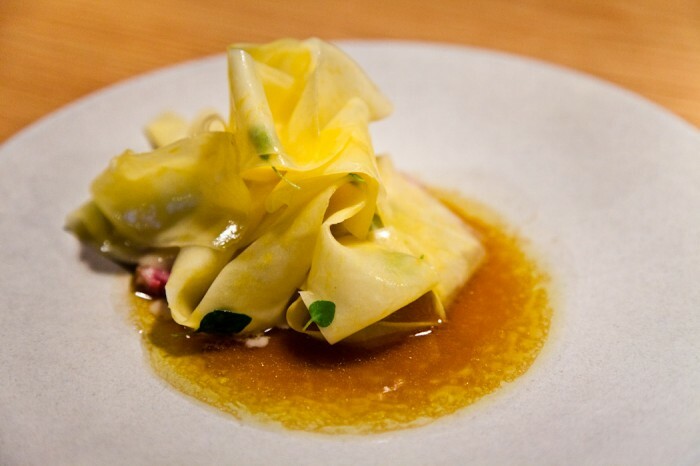 This dish was really refreshing. I don’t generally “get” roe, but it was a nice opener. Baked bintje, olives and buttermilk. This dish was simple but delicious. 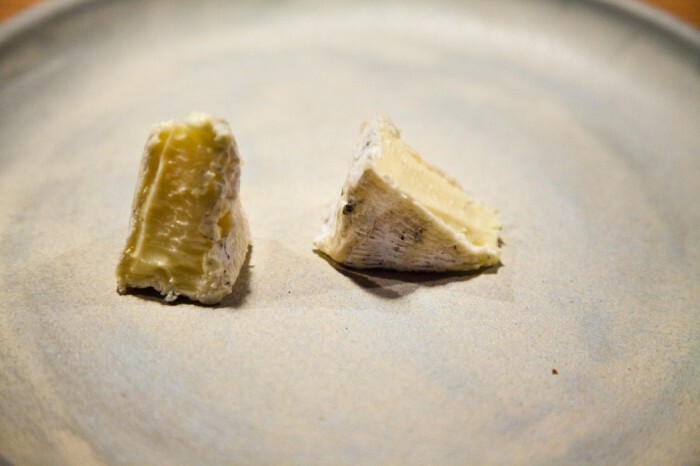 …we got the Troldehede cheese. The two male waiters wore some amazing leather butchers aprons. Wish I got a shot from the front but I’m pretty shy when it comes to involving people in my photo taking endeavors. Don’t let this photo fool you. It’s between servings…the tables were busy all night. 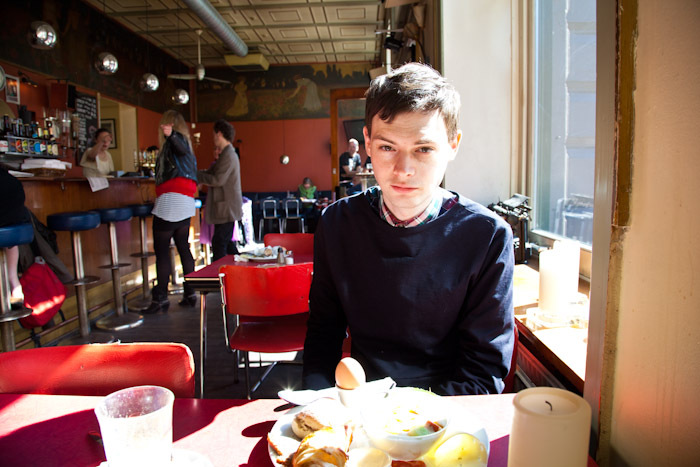 I just don’t like to make other diners uncomfortable with my clicking away so I took this photo during a break, just so you could see that it’s quite a casual and comfortable atmosphere. 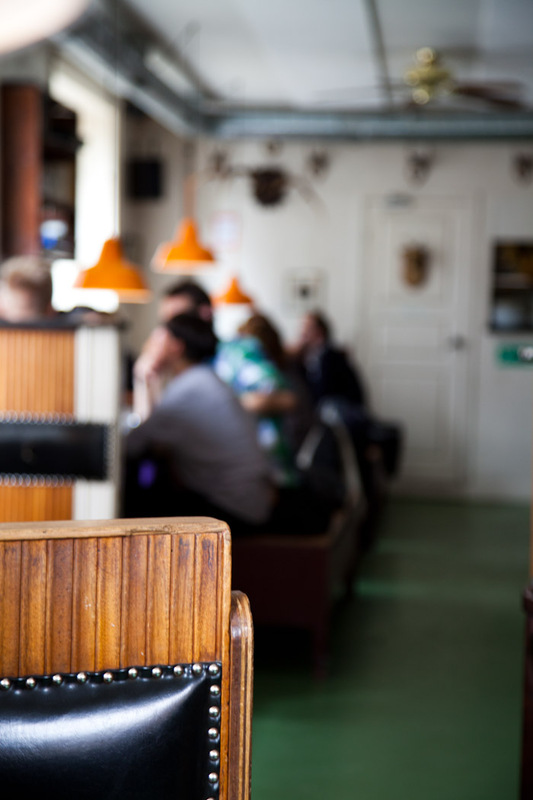 That said, people dressed up – it’s a date night type of place. I think this is the kieni, black currant, bread and olive oil. But that said, I have no idea what kieni is. But that’s the next thing on the menu so it must be this. Sadly this was the only disappointing item on the menu. But it could have just been my personal taste. I’m a chocolate dessert kind of person. We’ve been watching so many cooking and chef shows, it was kind of funny watching them live. 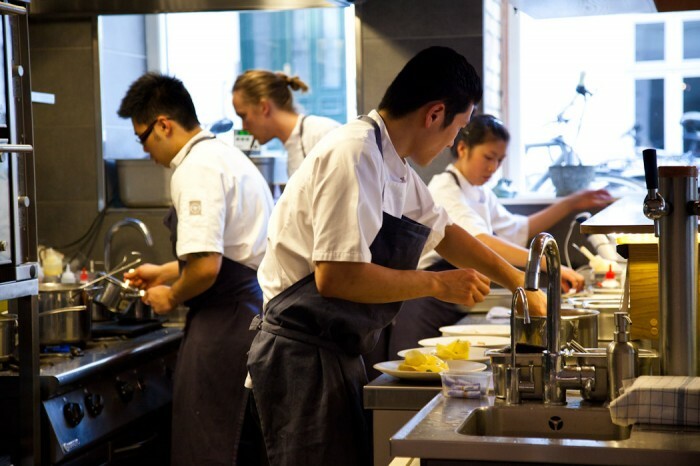 But the chefs in this kitchen are nothing but professional and focused. After dinner we took a walk along Jægersborggade. 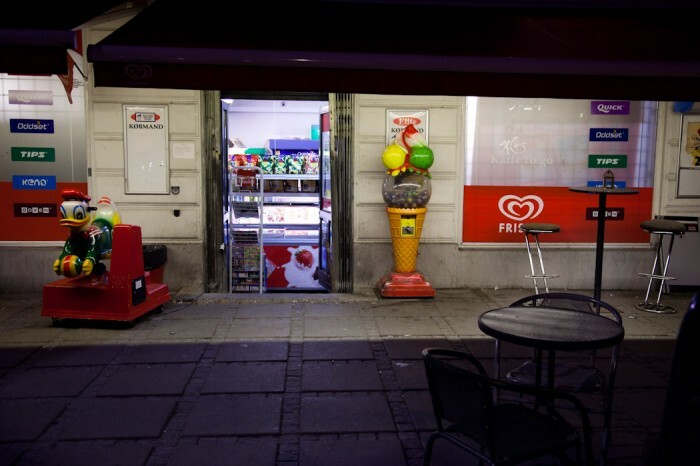 It seems like the type of area that once had nothing going on, and then the artists came and opened studios, and restaurants and bars followed. 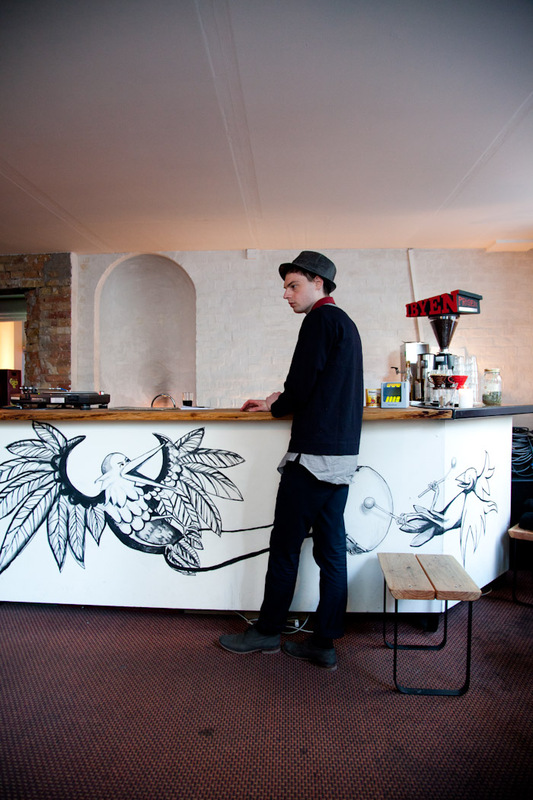 Writers, artists and shoe makers. 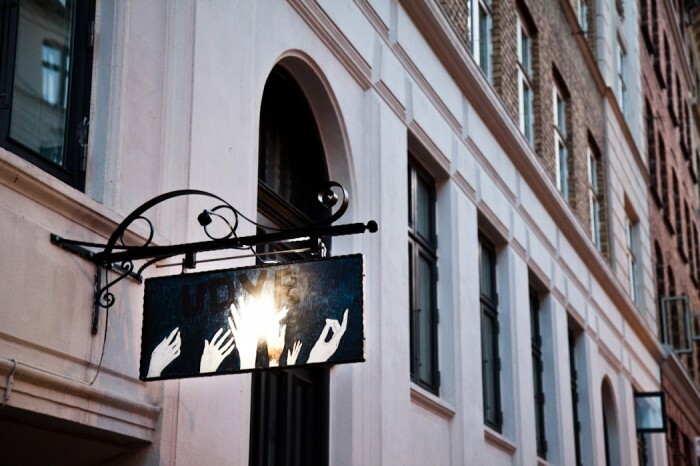 The street even has its own website! 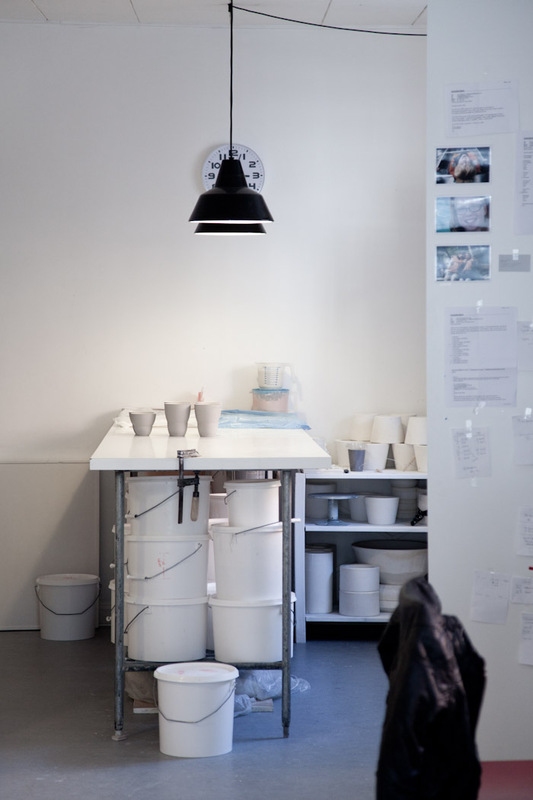 We stumbled across the ceramicist who made all of Relæ’s stoneware. 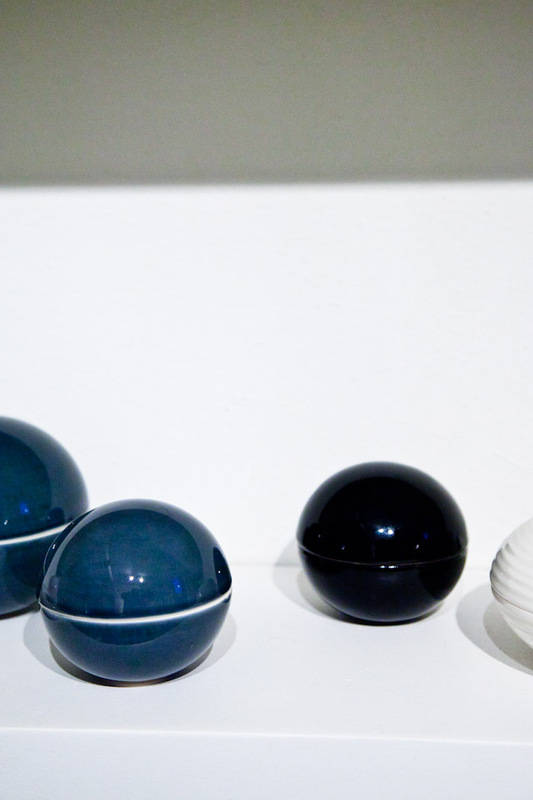 We lucked out as Julie Bonde Bülck was still in her studio! I’m a window peeker. Sorry. 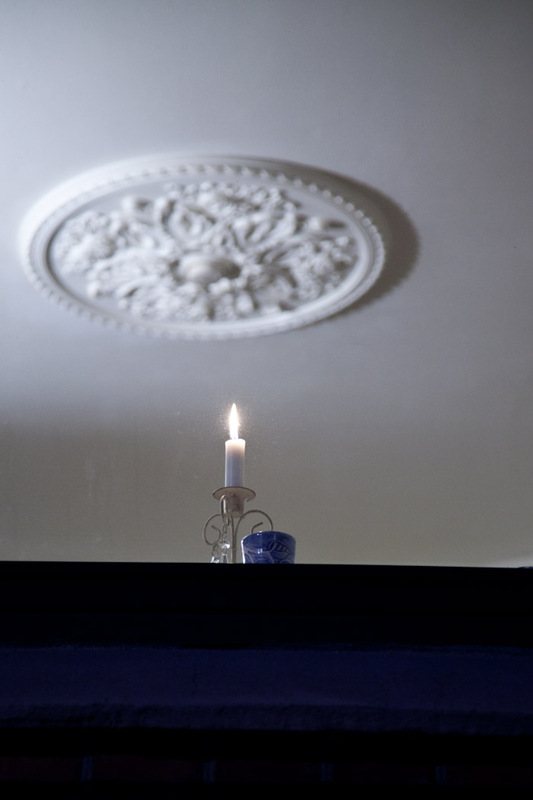 I really love the candle in the window thing that Scandinavians do. 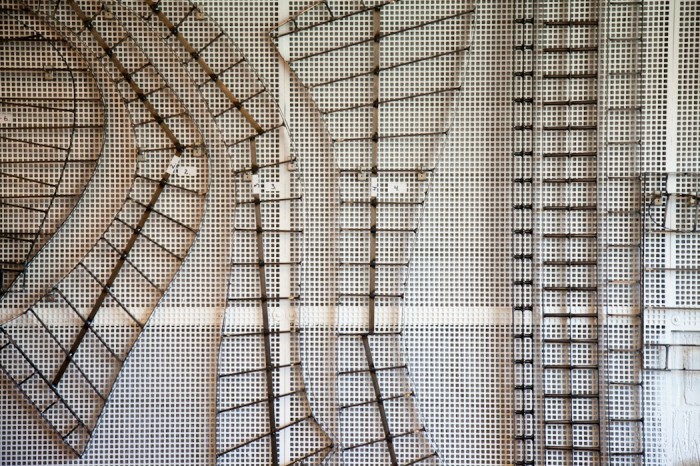 Loving the use of peek-through frosting that many of the studios have. It gives them privacy but offers a glimpse. Wish we had time to come by during the day. Next time! We woke up early for our day trip to Fredericia. 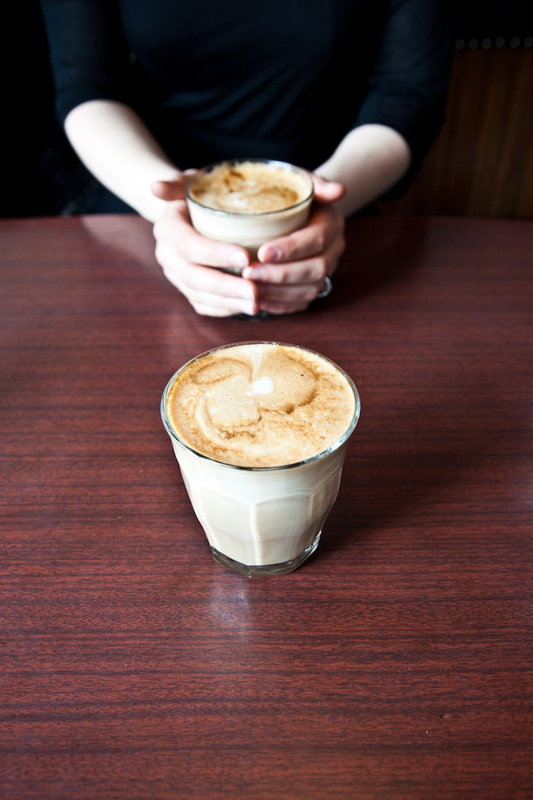 Wanting to start the day off right with some fresh brewed coffee and a big breakfast, we stopped by Granola, a charming 1930s inspired cafe, which is conveniently only a 5-10 minute walk away from the train station. 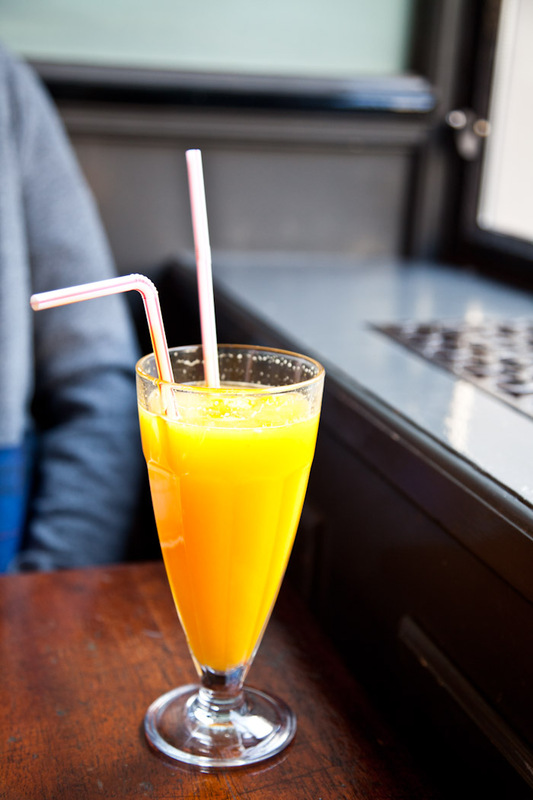 The orange juice that morning was particularly good. 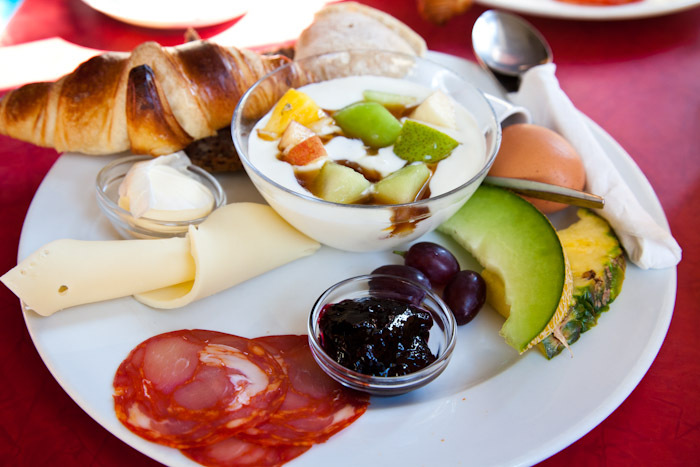 I got the big breakfast platter which came with a soft boiled egg, ham, cheese, toast, and fruit salad. I think the coffee and juice was all included. Juli got the egg sandwich with house made ketchup. 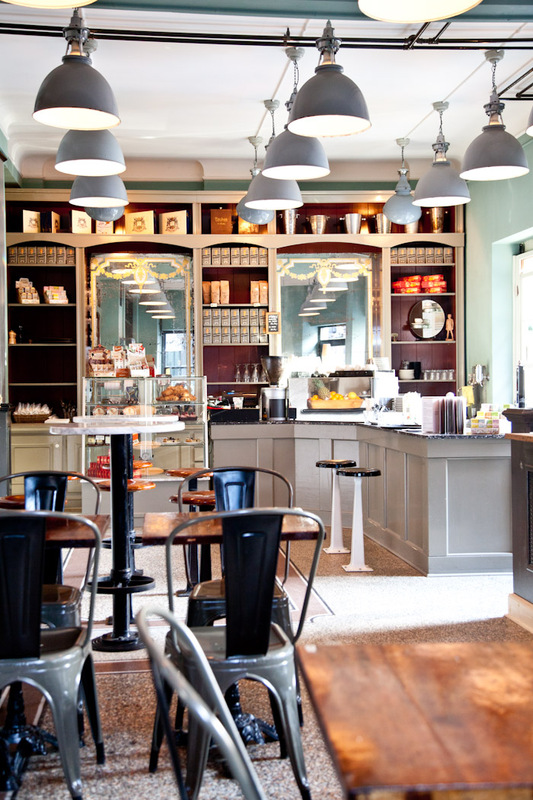 The interior of Granola is very authentic, it’s like going to a museum but everything is shiny and new. 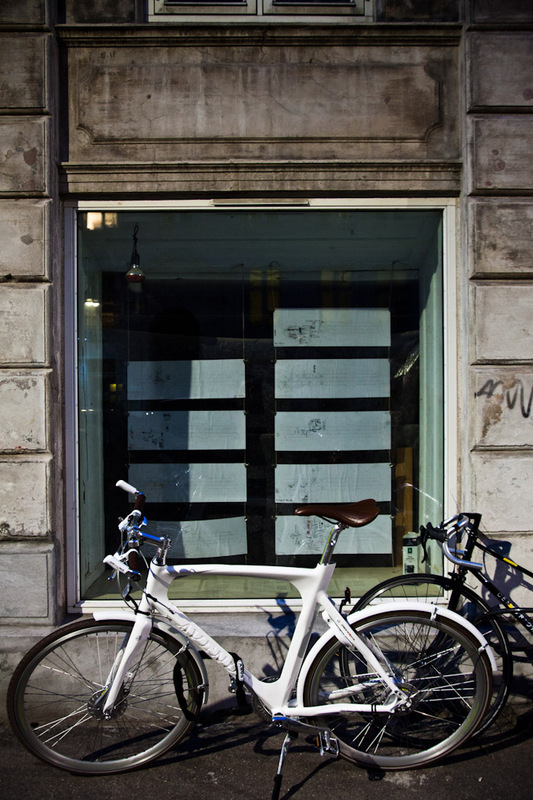 If you’re looking for a good breakfast in Copenhagen this is a really good pick. 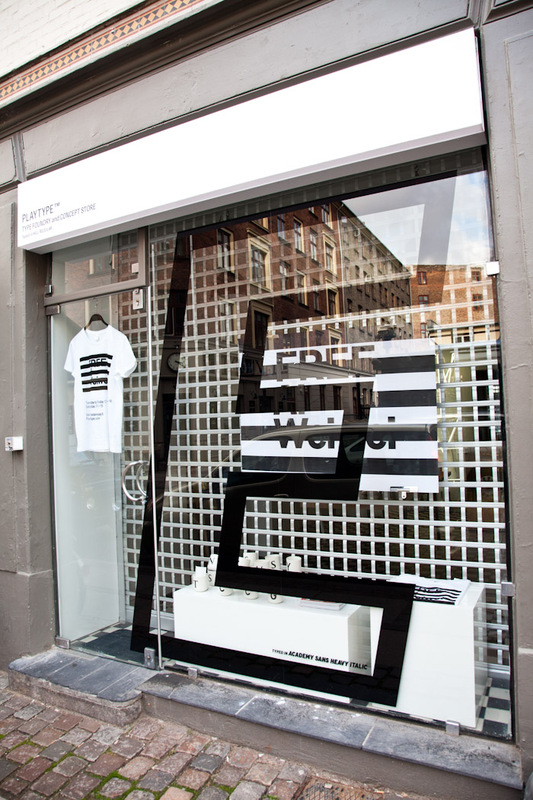 On the way to the train station we stopped by the Playtype concept store (it’s just down the street). You can check out the Globe and Mail article here. Unfortunately it was closed, and we had a train to catch, but it was great at least peeking into the window and seeing some of the products in person. 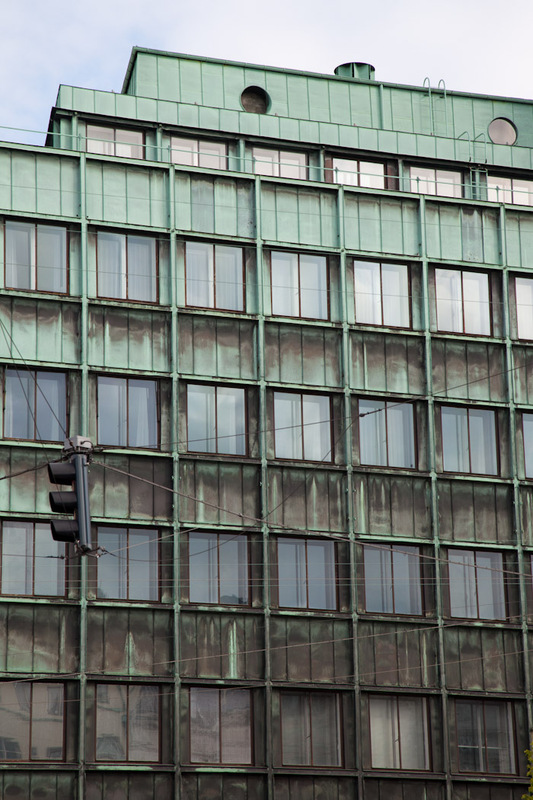 I think most of the world’s copper is on buildings in Copenhagen. After a pleasant 2 hour train ride we arrived in Fredericia where we were picked up by Liza Friedman, our friend and Fredericia’s International business development manager. 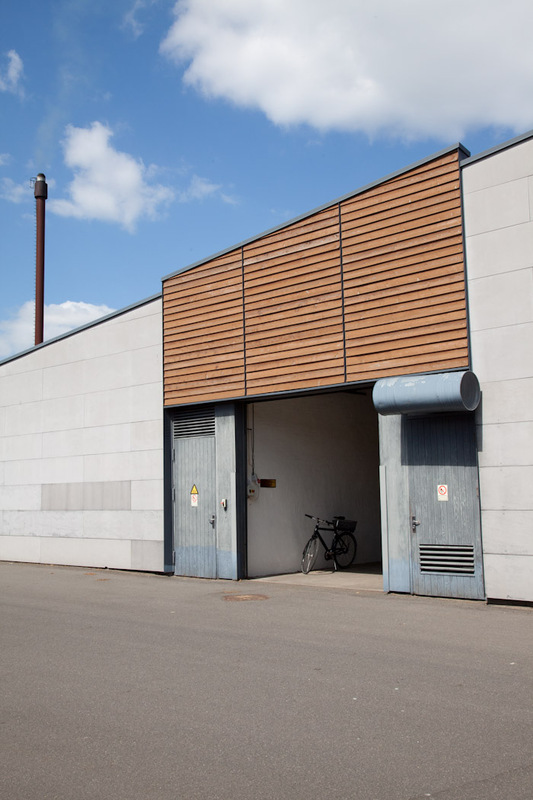 We walked up stairs to Fredericia’s office to meet face to face people that we had until this point only knew through exchanging emails. 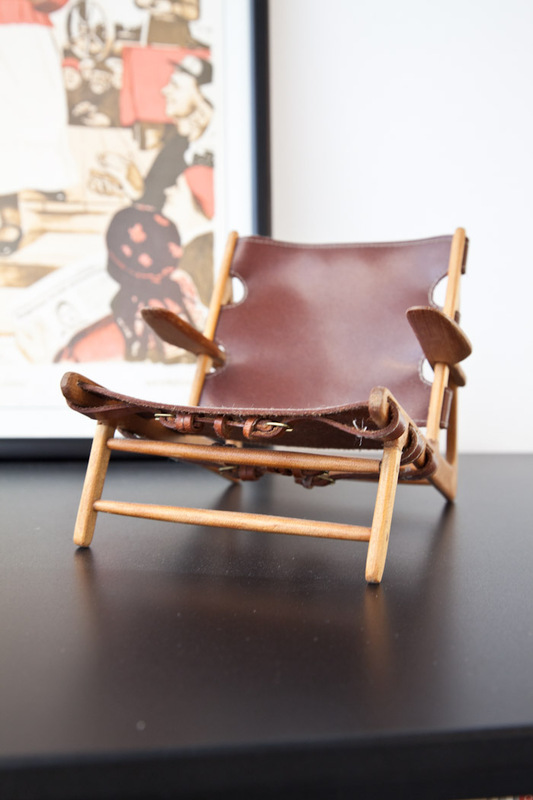 I made a bee-line to these small models of Børge Mogensen chairs, all original models in stunning detail. In the photos they look as if they could be life size. 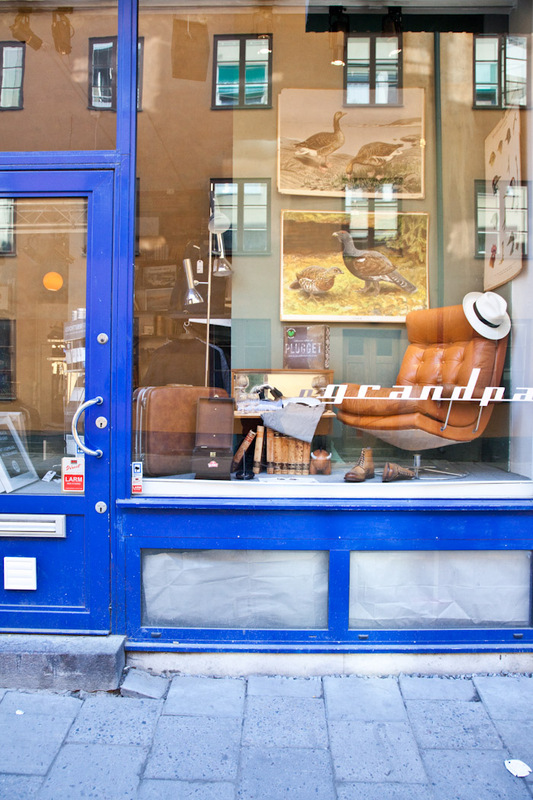 My favourite was the Børge Mogensen hunting chair model, complete with brass buckles. 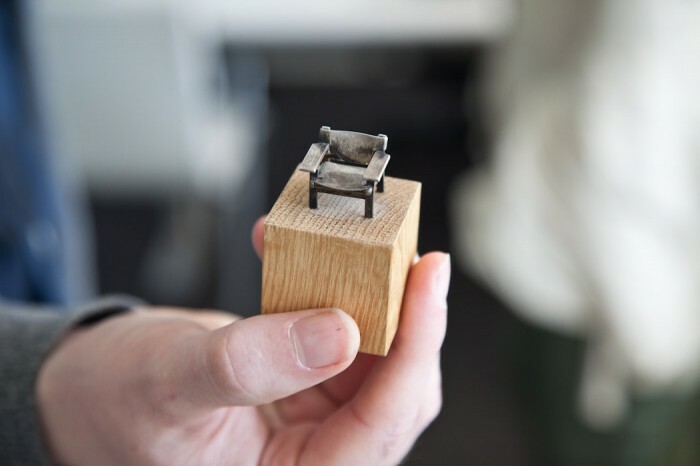 A tiny scale model of the Spanish chair. 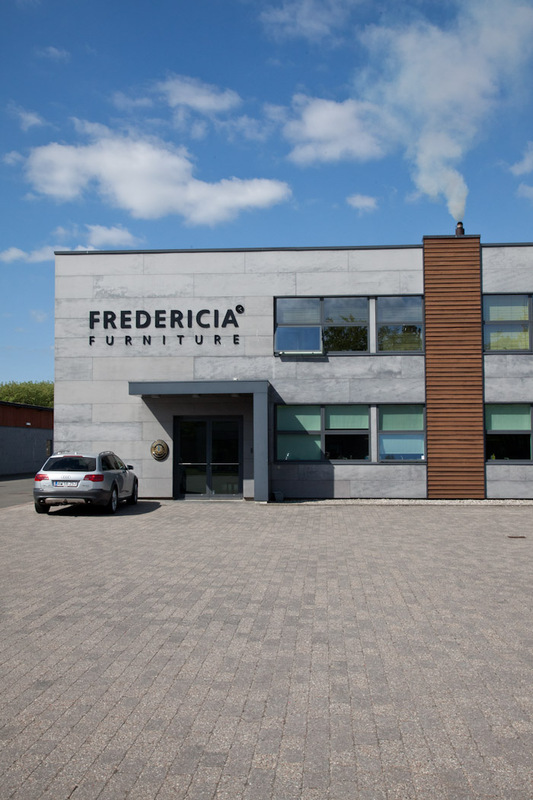 We had the pleasure to meet with Thomas Gravensen, the commander and chief of Fredericia furniture, who along with Liza took us on a personal tour of the factory. 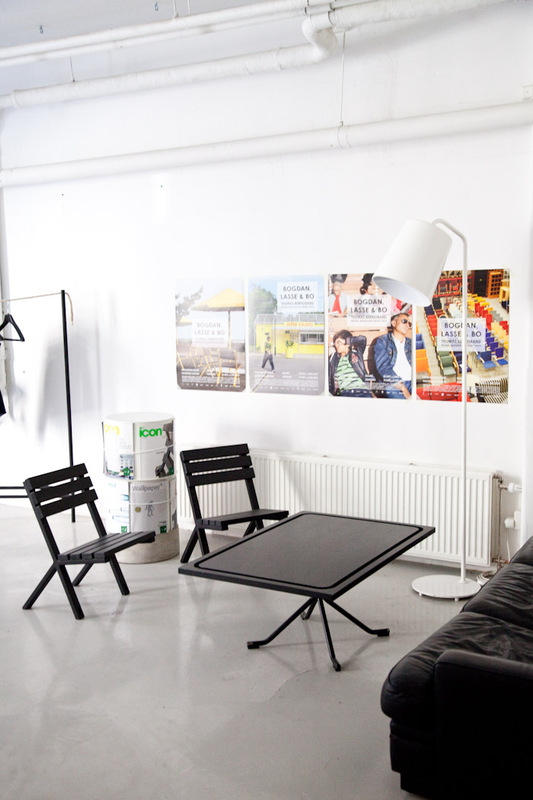 We started out in the showroom where we all sat down and had a some great conversations about Børge Mogensen, mid century design, and Fredericia’s impressive new collection. 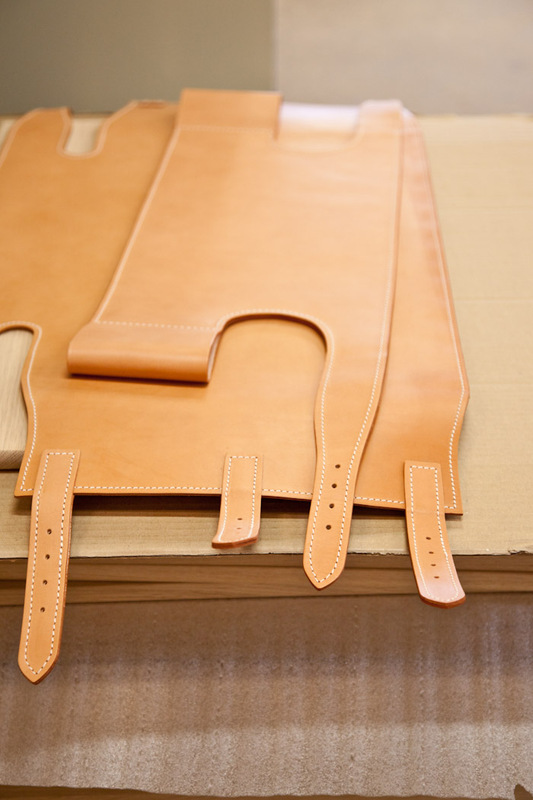 Leather for the Børge Mogensen Spanish chair, we currently have one in our showroom if you want to come see for yourself how beautiful it is. 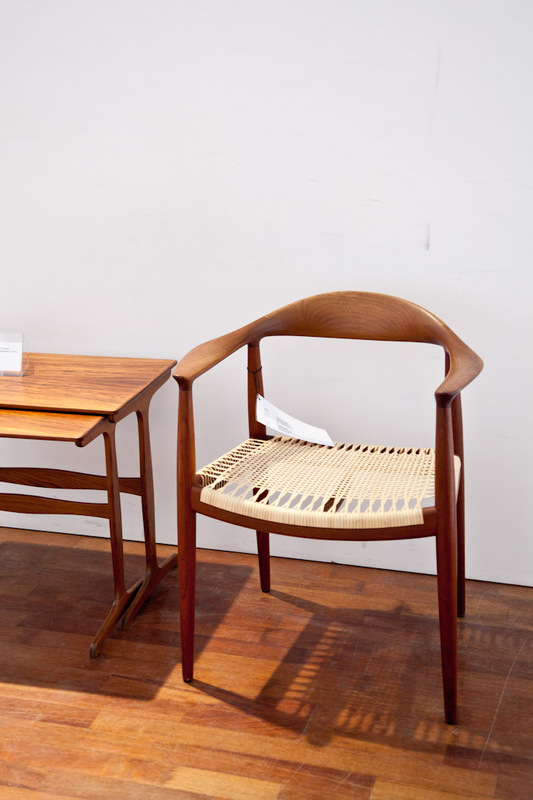 When you think of Danish modern design it is very easy to conjure up images of clean lined teak furniture, but when you really think about the big mid century designers like Hans Wegner, Finn Juhl, and Børge Mogensen you start to see that there aren’t as many similarities as you might think. 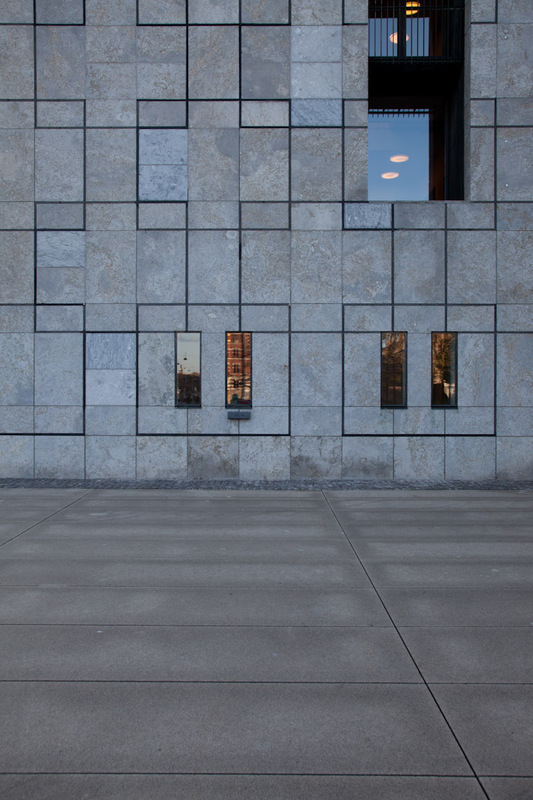 Their personal styles and interpretation of the Klint school are widely different from one another. 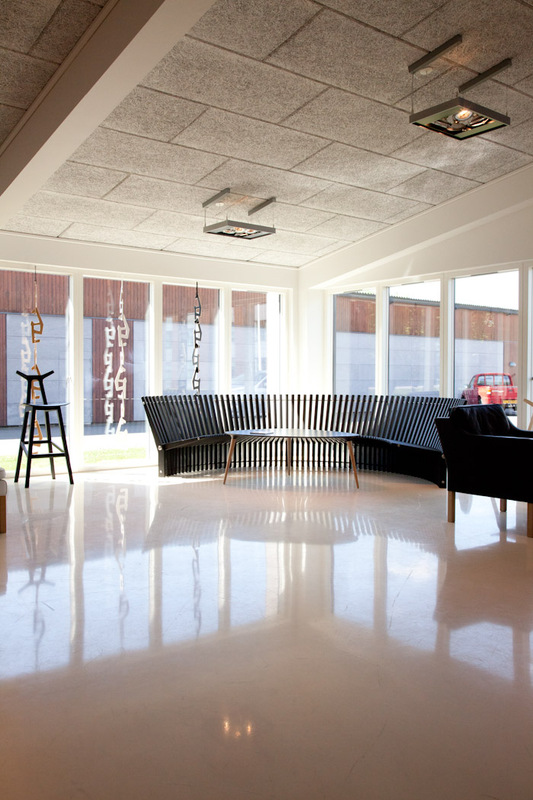 The Klint school itself refers to the furniture school founded in 1924 at the Royal Danish Academy of fine arts, lead by architect and designer Kaare Klint. 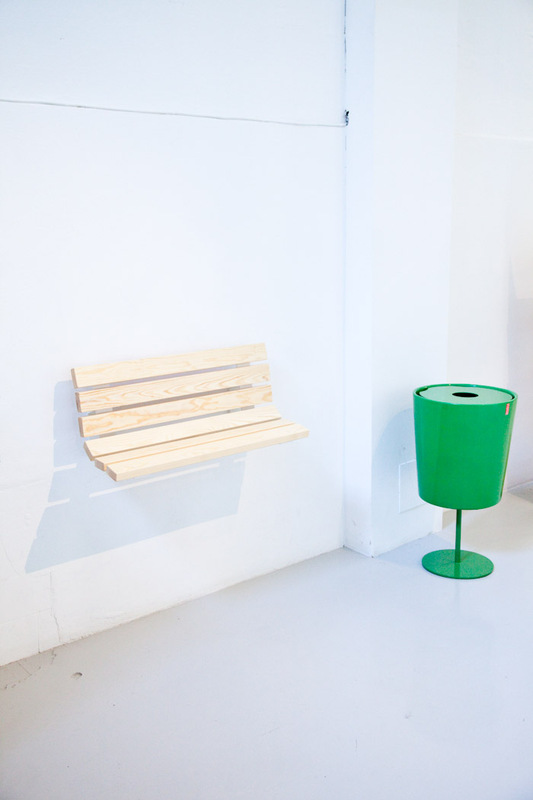 The Klint school’s philosophy was that furniture was a tool and therefore the design’s functionality was deemed more important than its aesthetics. 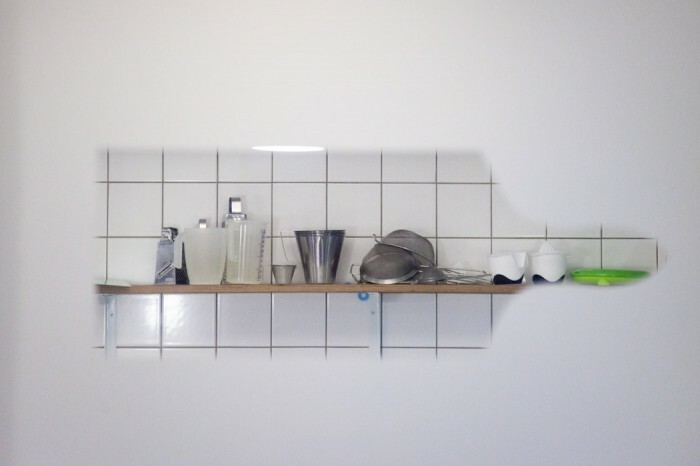 While designers like Hans Wegner and Finn Juhl blurred the line between function and aesthetics, Børge Mogensen stayed true to his teacher’s philosophy. Mogensen created his own signature aesthetic, cutting solid wood in the same way it would naturally appear in nature instead of bending it. 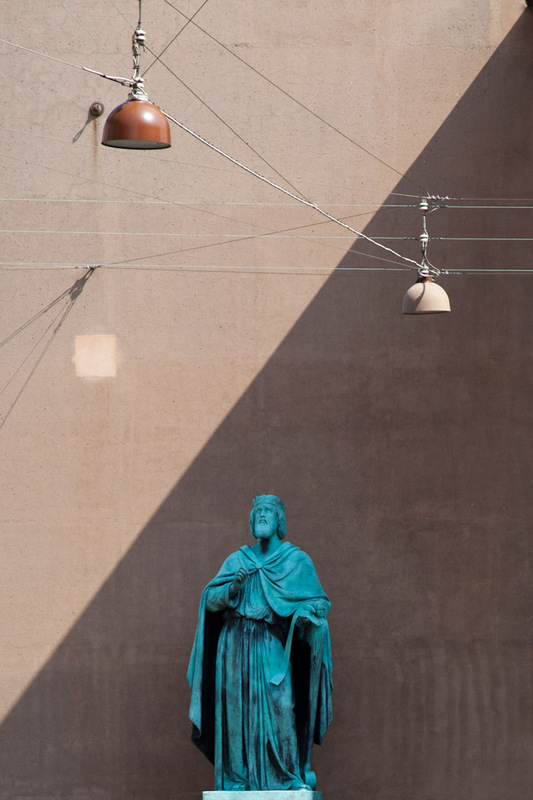 This gave Mogensen’s pieces a strong and monolithic aesthetic, compared to other famous designers of the time. 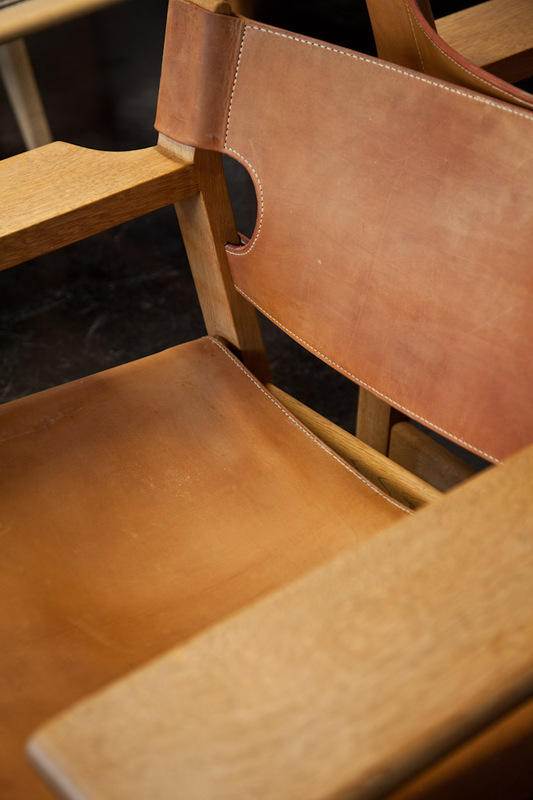 This is perhaps why his classmates Hans Wegner and Finn Juhl maintain a mainstream appeal, while Mogensen’s pieces appear to be modest in comparison. 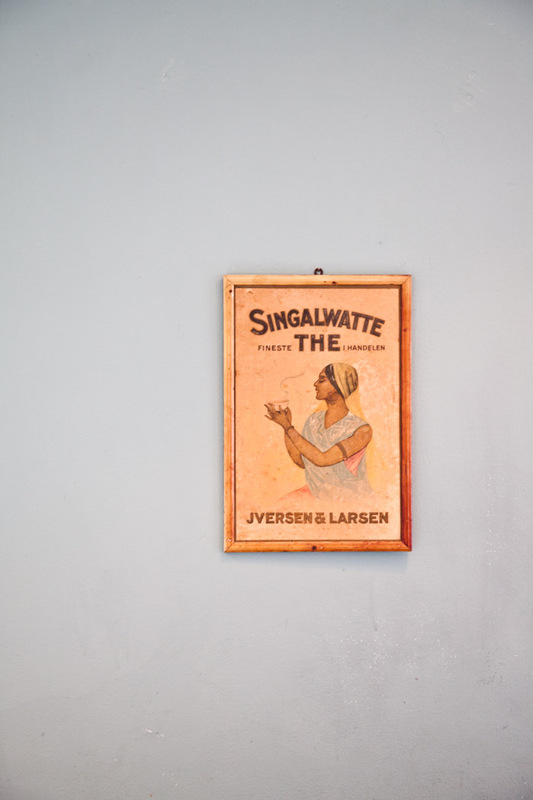 This modesty stems from a social conscientiousness, Mogensen saw his furniture as tools for the family home, many of his most famous designs were made for his family first before going into production. 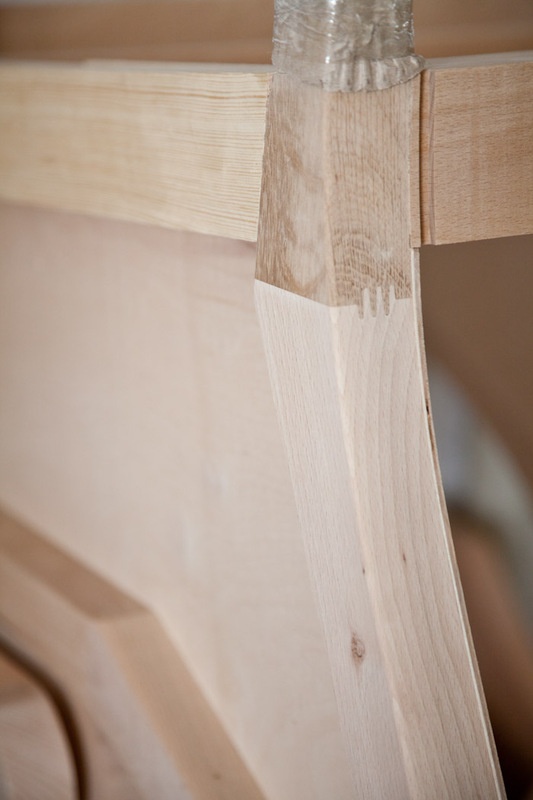 The simplicity of Mogensen’s furniture can be seen only at first glance, when you study his designs for a moment you notice the masterful construction, beautiful materials and proportions. Thomas told us a funny story that I think really encompasses Mogensen’s personality and perception. 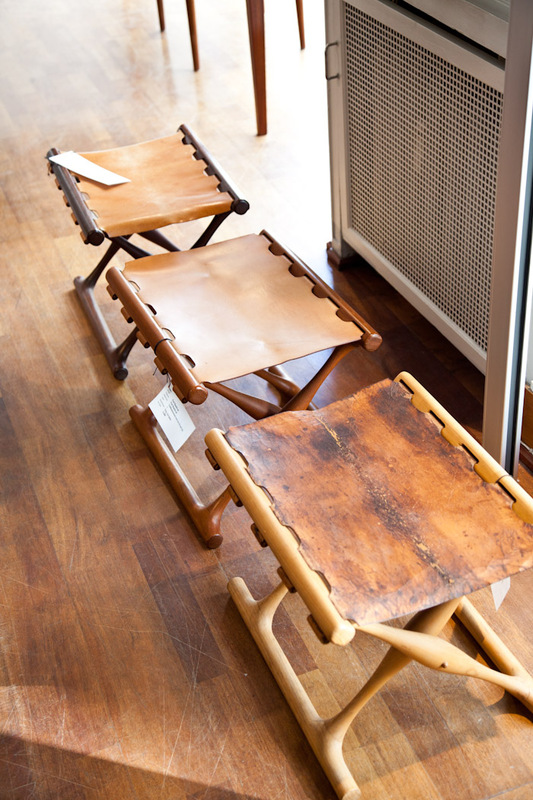 During a very important exhibition for Hans Wegner, Mogensen sat in an exhibited chair and turned to Wegner and casually said “Well Hans… One can sit in it.” I loved hearing that. 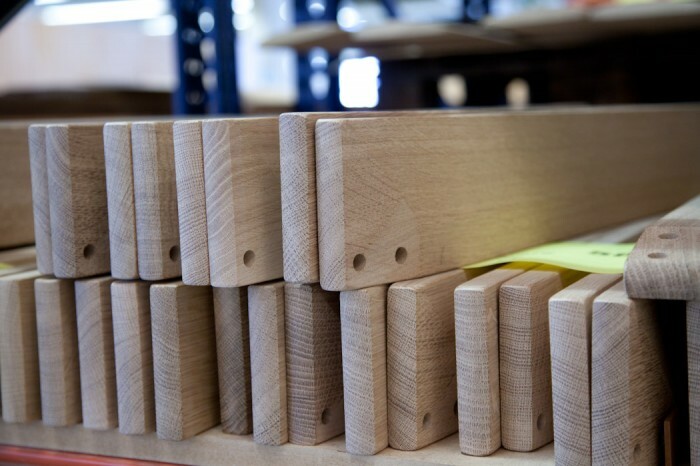 A collection of quarter-sawn white oak. 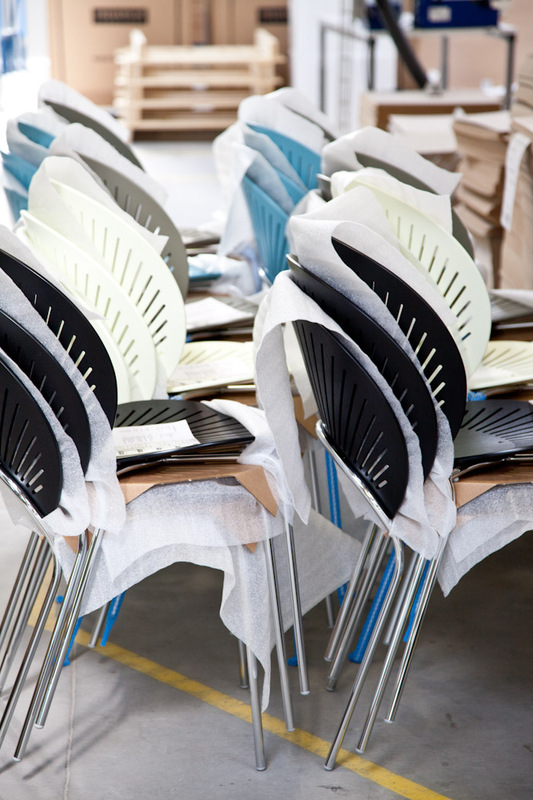 Stacks and stacks of Trinidad dining chairs, one of the most comfortable chairs we have ever sat in. We have them around our desk at the shop. 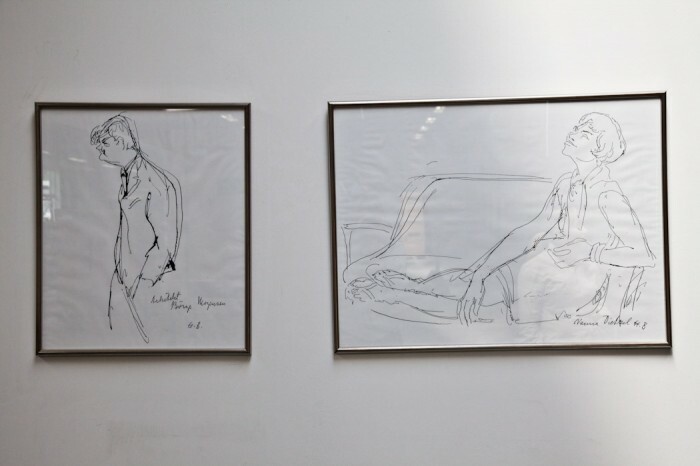 Original illustrations of Mogensen and Nanna Ditzel by a famous Danish caricature artist. Molds for leather cutting hang from the walls. 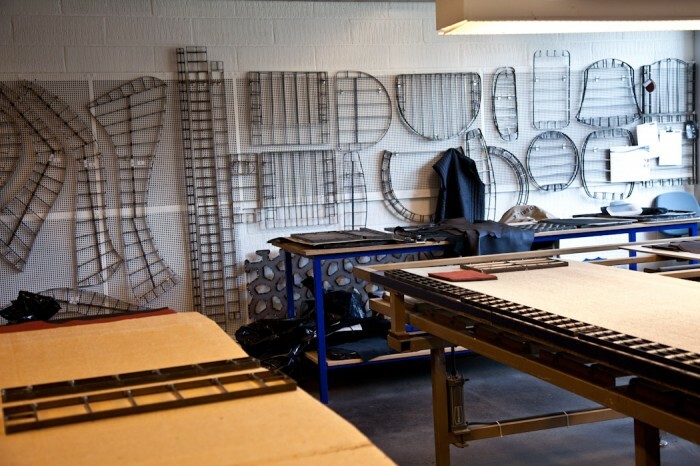 These are the the molds for the iconic arm of the Mogensen sofa. 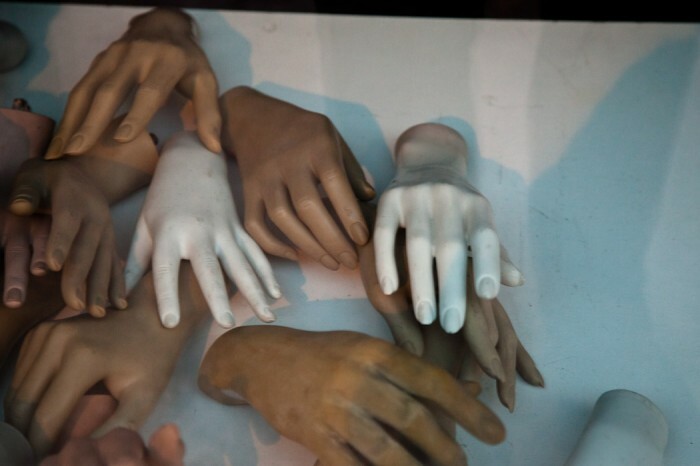 They strategically place these molds so that as little leather as possible is wasted. 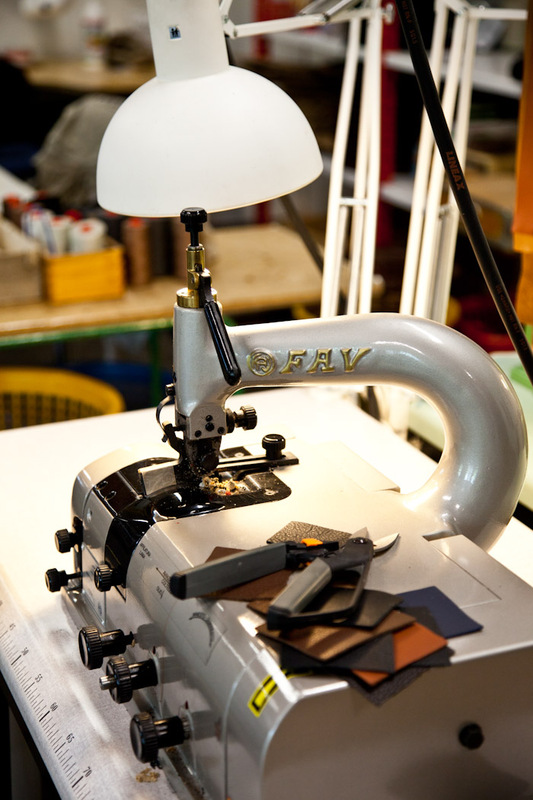 After the leather is cut all of the pieces are sewn meticulously using these machines. 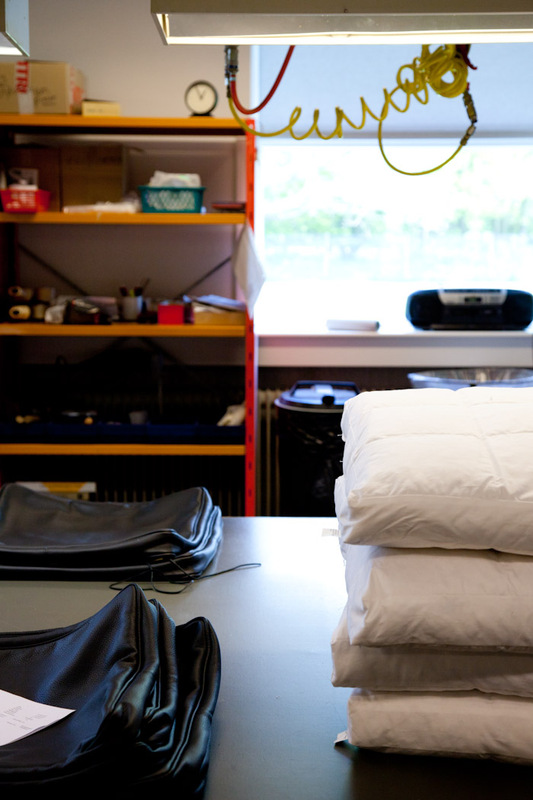 A collection of leather sofa covers ready to be stuffed with their pillows. 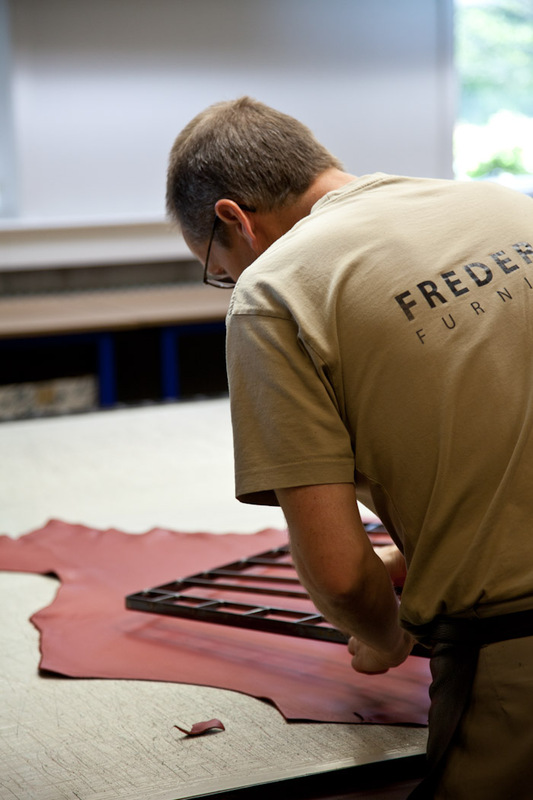 It takes two people to upholster a Borge Mogensen sofa because the leather has to be pulled super tight so there are no wrinkles. 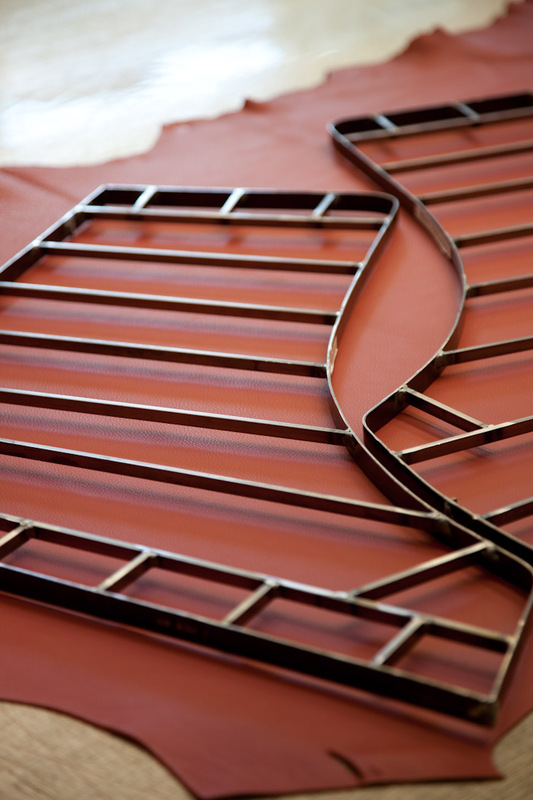 The piping is a very beautiful detail that relies on a perfectly executed upholstery job. 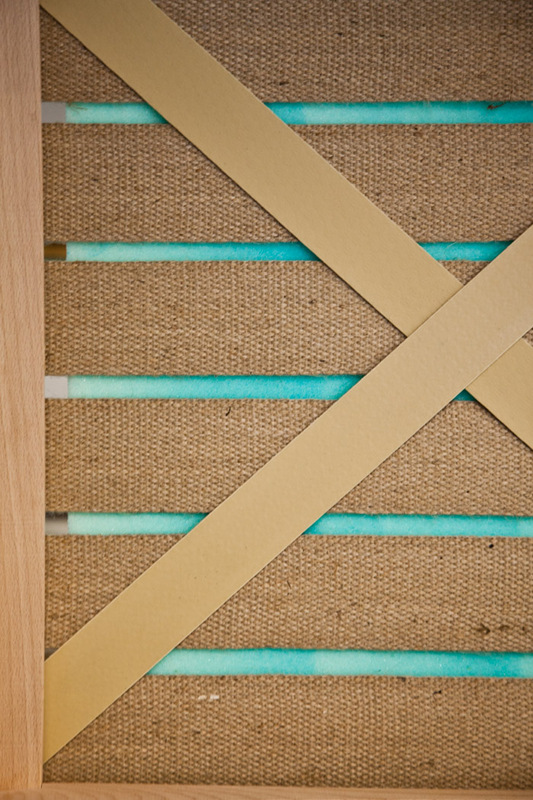 The construction of the sofa uses many different natural materials including pure jute webbing. 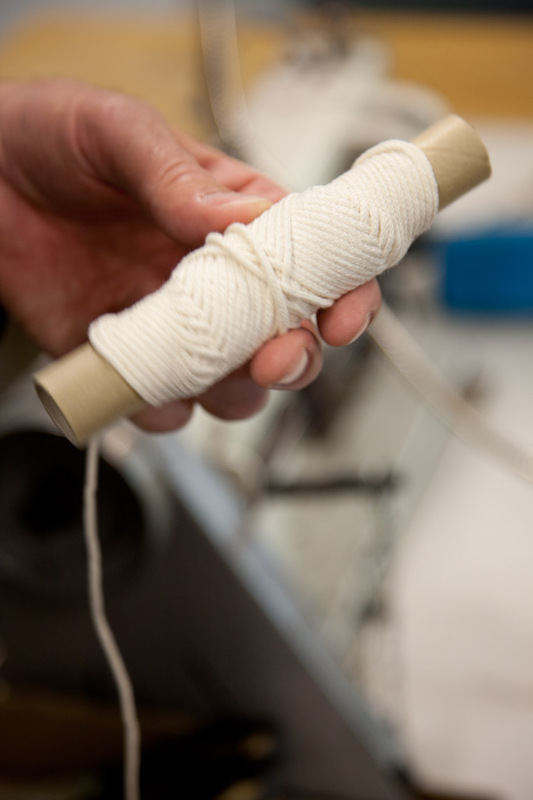 The cotton string is used instead of synthetics since materials like nylon take a long time to wear and can actually cut up the insides of a sofa from the owner’s weight after long periods of use. Cotton is much less abrasive, and having all of the materials age with each other naturally lends to the long life of each Mogensen sofa. 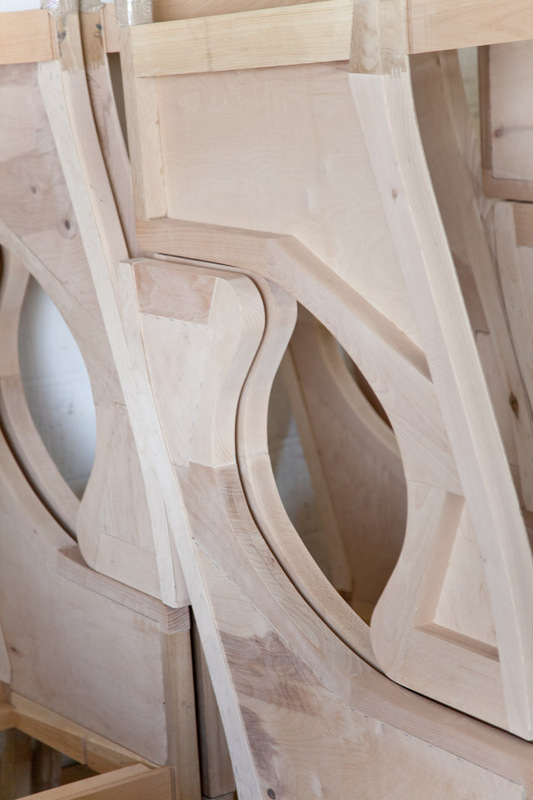 The last part of the studio was seeing the raw solid wood carcasses of the Mogensen wing chair. Even in their most stripped down form, they look strong and solid. 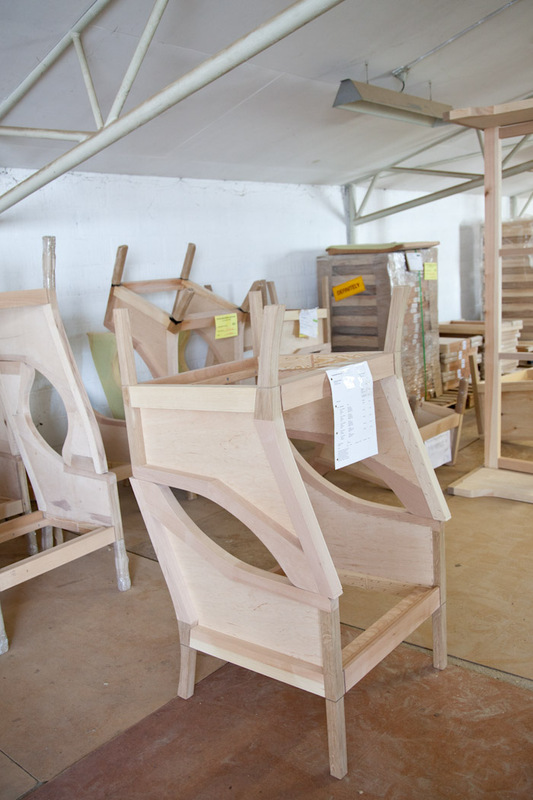 Each frame is made with a combination of solid beech wood and solid white oak, two very strong and stable hard woods. Thank you for the tour, Liza and Thomas! 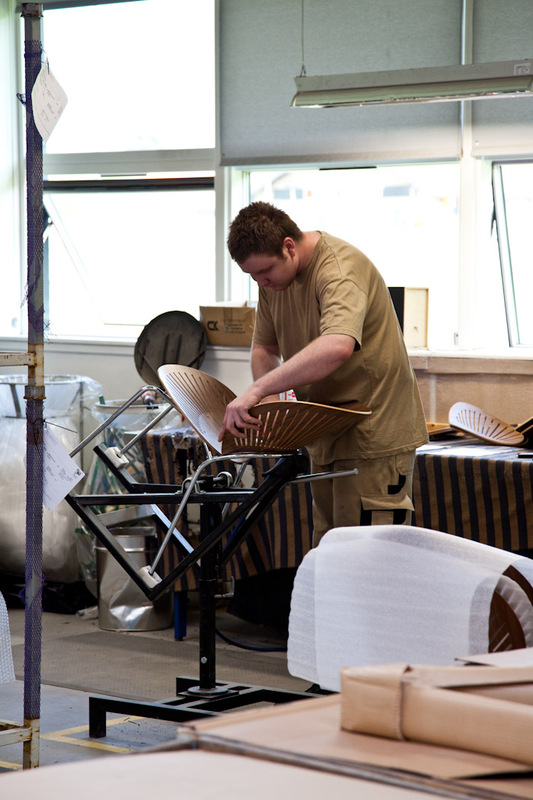 We really appreciated seeing where some of our favourite furniture pieces are made. We hope you enjoyed it too! 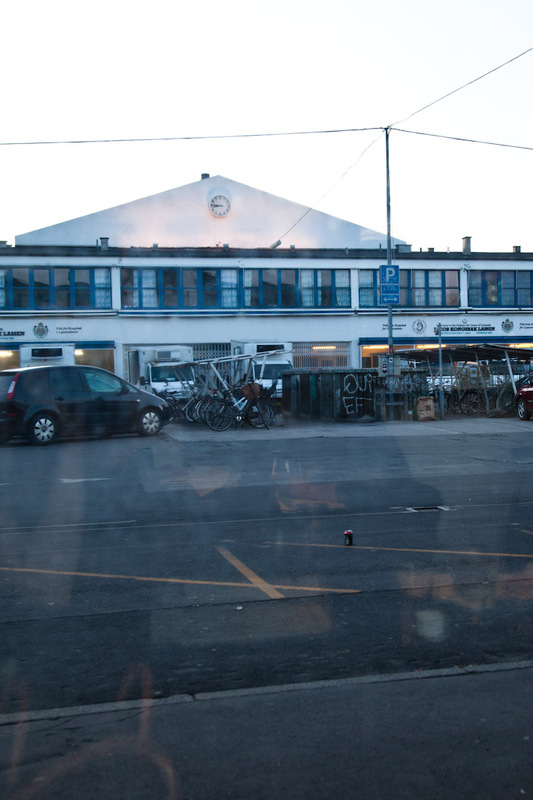 We arrived in Copenhagen after a 3 hour flight from Reykjavik. 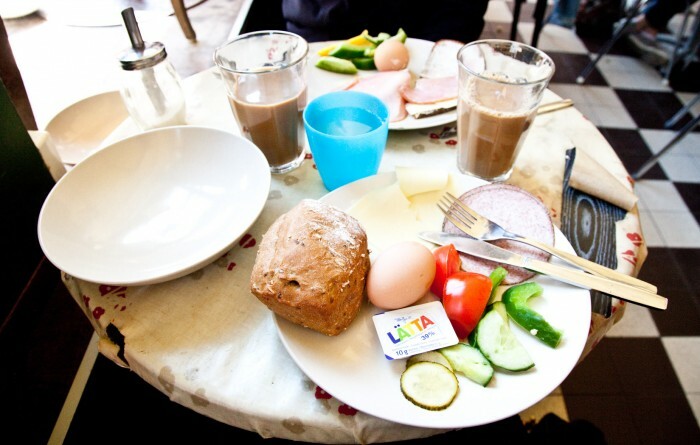 Unfortunately due to the time change we were having what felt like breakfast in the late afternoon in Copenhagen. 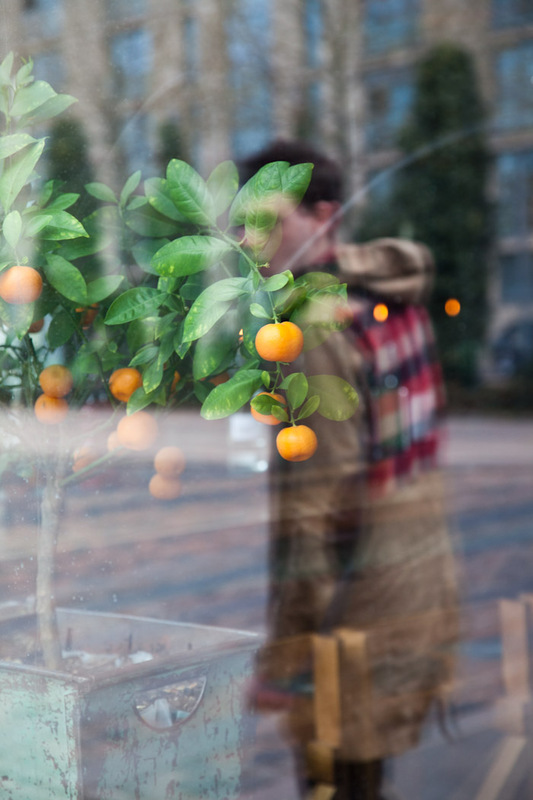 We dropped off our bags at the hotel and trekked over to Cafe Dyrehaven, one of the coolest local spots in Copenhagen. 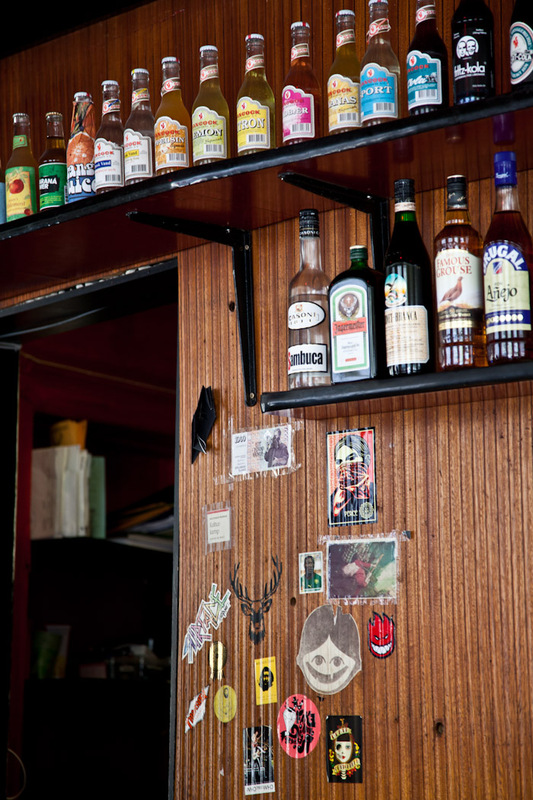 In the 70s this place used to a really dodgy bar, one could even use the term drug den. 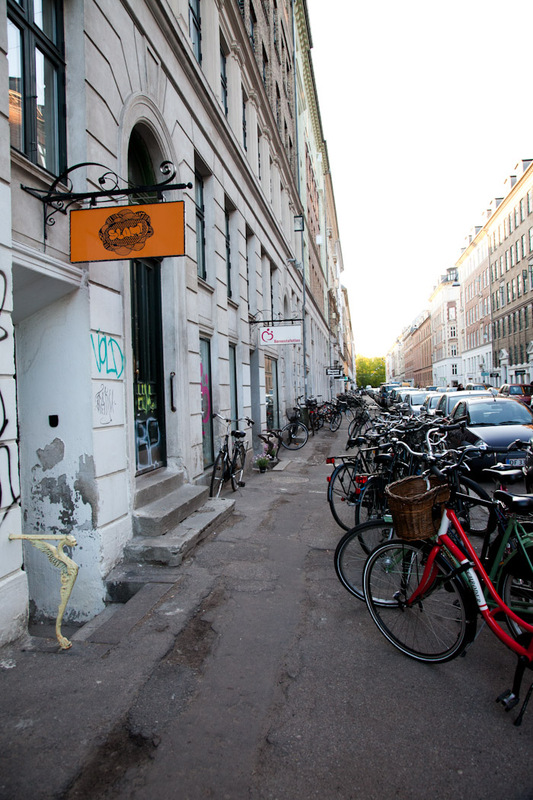 Of course like many rough neighborhoods the cafe now caters to young locals in the hip Vesterbro district. 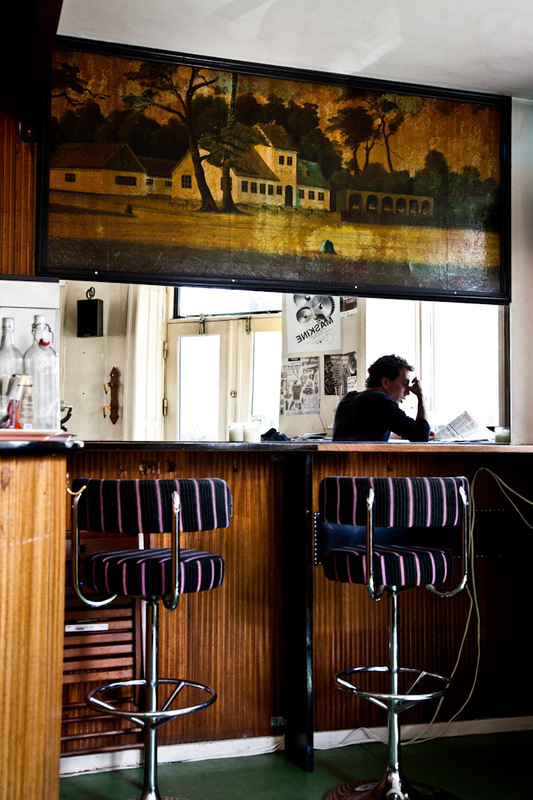 The bar looks as if it has been untouched since its opening. I knew this place had a reputation for a good Eggs Benedict so that’s what I wanted to get. 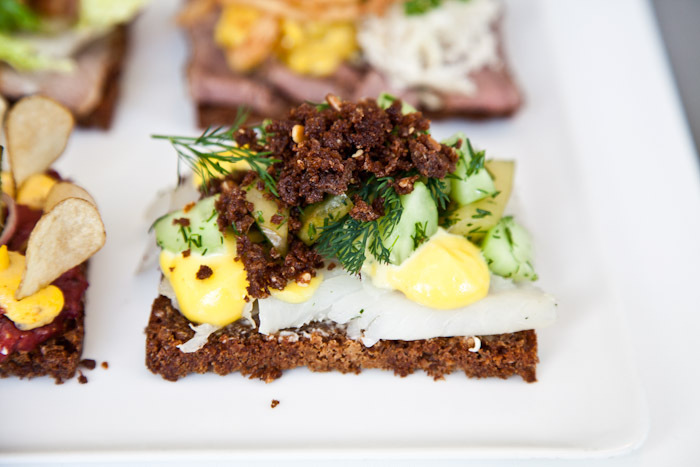 The eggs sat on a piece of dark rye Rugbrød, the combination was fantastic. I think it may even be better than an english muffin. 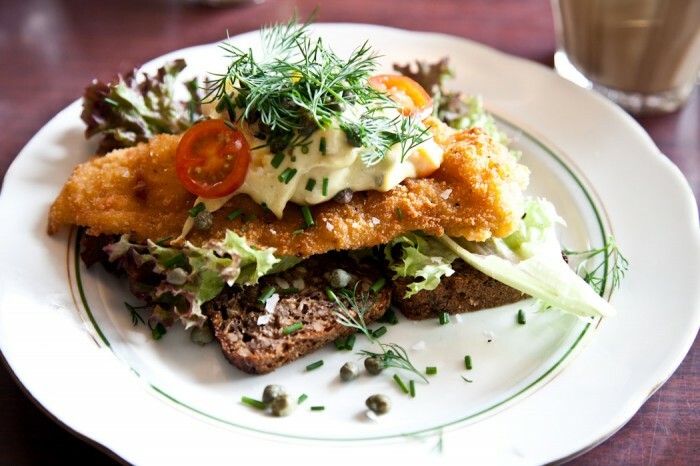 Juli had the fried cod with buttery dill on rugbrød. After breakfast we took a long walk, it’s been a good 2 years since we were last here but everything is still so fresh in our minds. 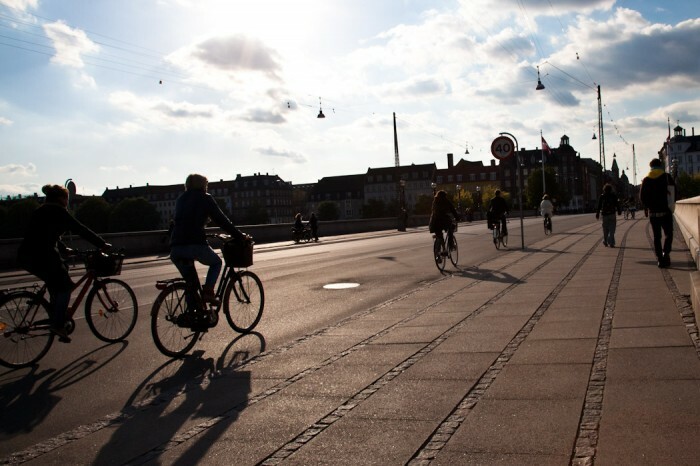 Danish bike culture is amazing. Then again, we shouldn’t take it too hard. 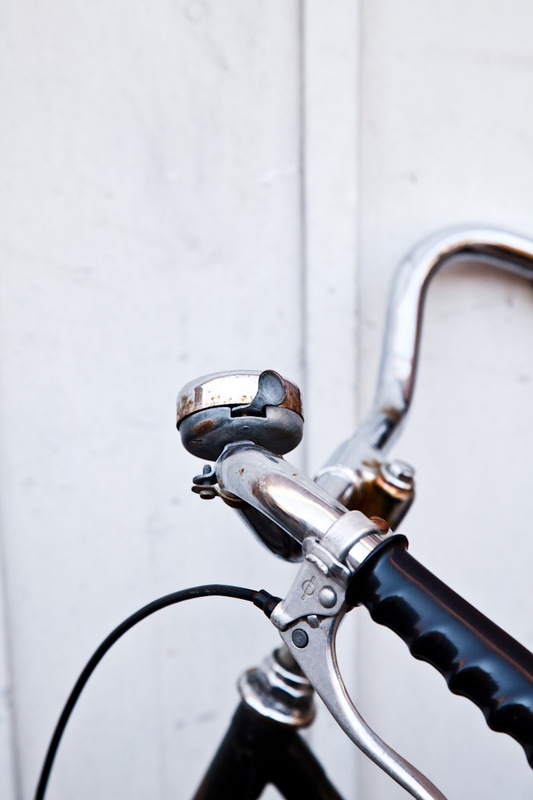 There are no hills, and no notorious bike thieves like we have in Toronto. 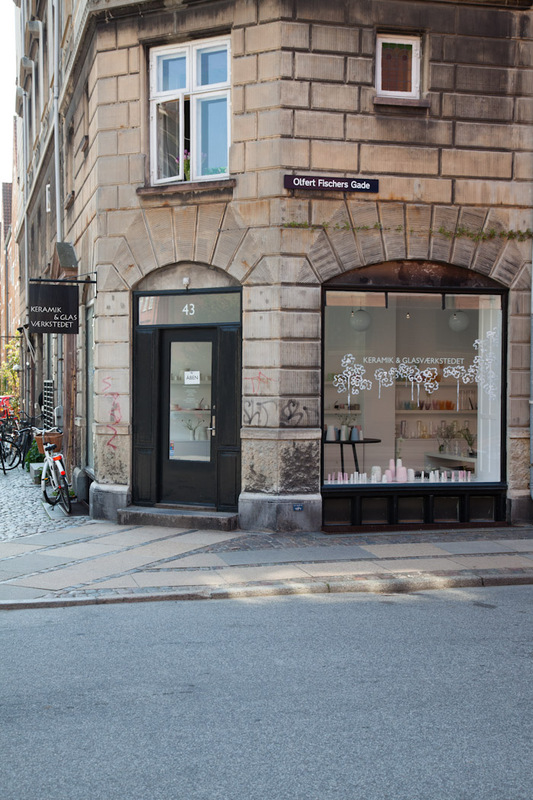 We didn’t have much time to visit many shops but we wanted to visit Klassik, one of the largest collections of mid century Danish design in the city. 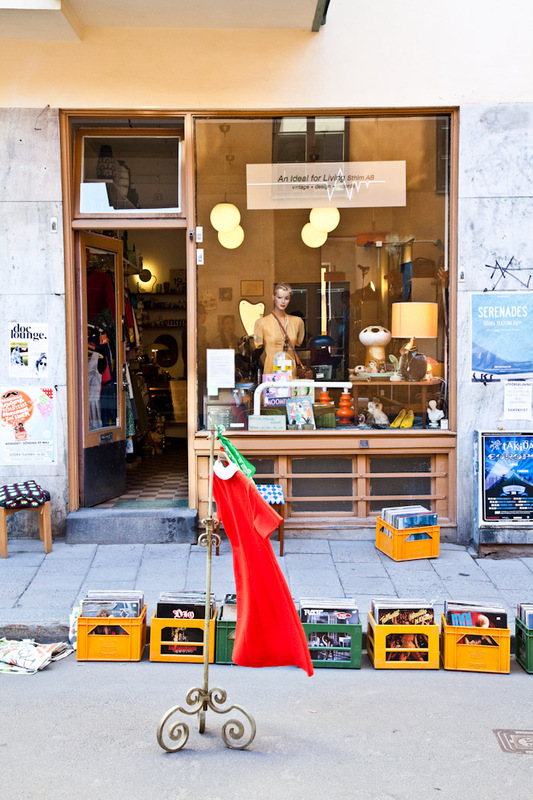 I also really wanted to visit Dansk Mobelkunst which I would say is the best curated vintage shop in the city but it seemed to be missing. Maybe they moved? 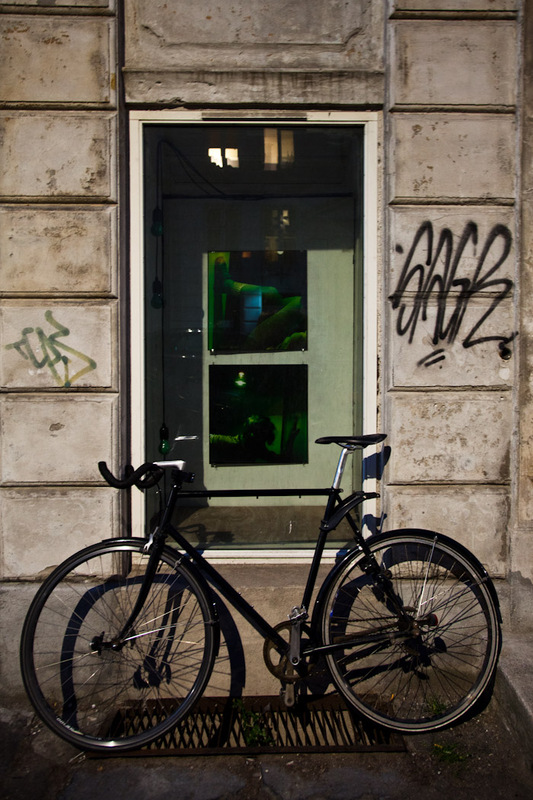 Maybe we walked right by it and missed it… Next time we’ll write down the address. 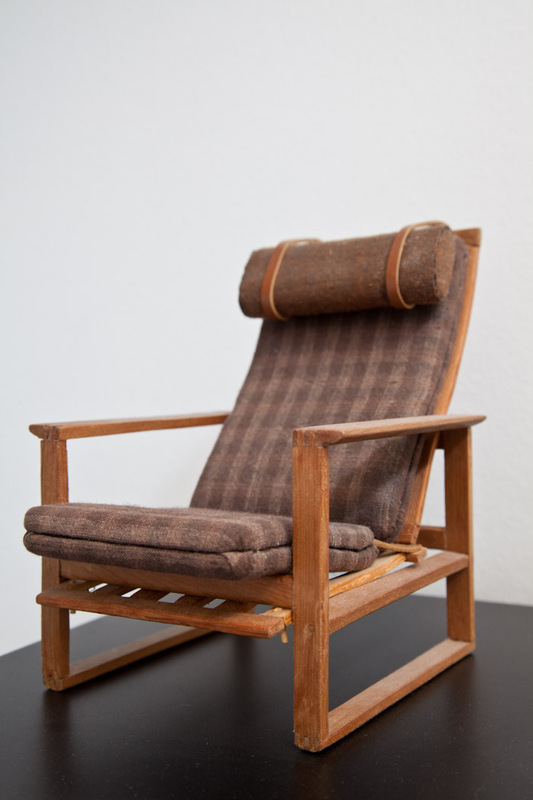 A beautiful specimen, a vintage Hans Wegner “the chair”. 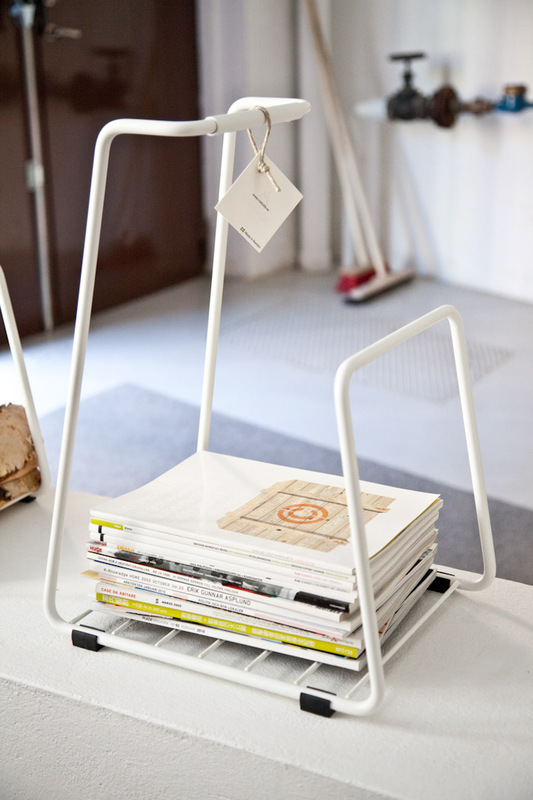 Three amazing Poul Hundevad stools, on my wish list for sure. 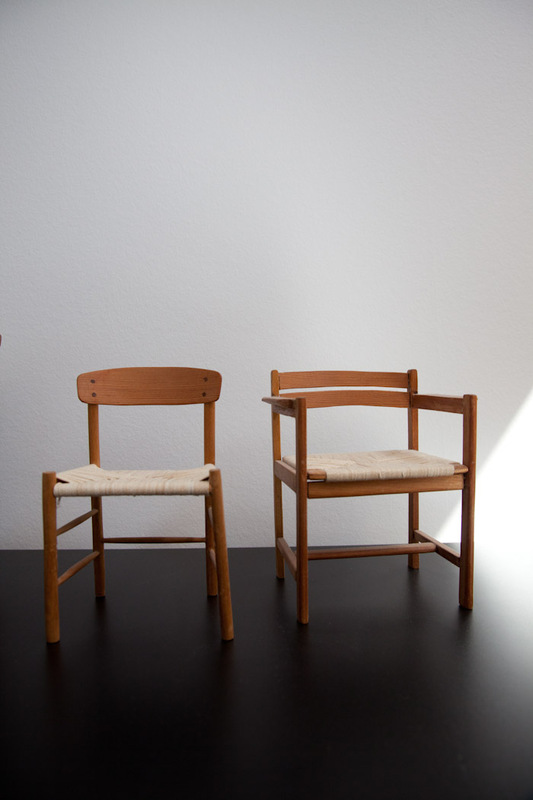 One of my favorite chairs of all time, the Spanish chair by Børge Mogensen. We sell them in the shop! 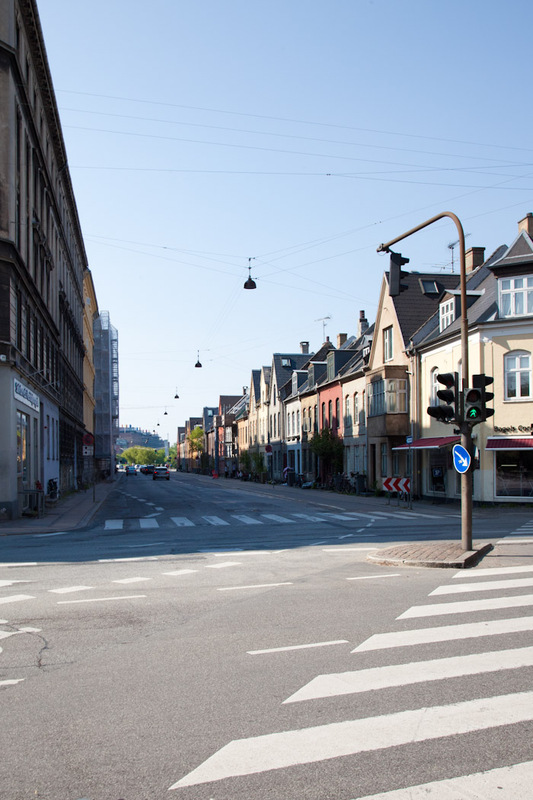 There is a really cool street called Jægersborggade which we kept on coming back to during our stay in Copenhagen. 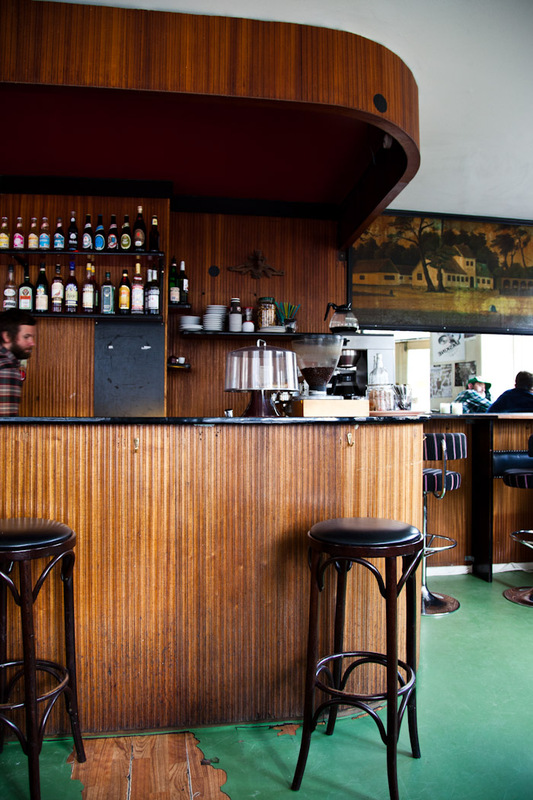 It has an amazing collection of great cafes, bars, and some of the best eating in town. 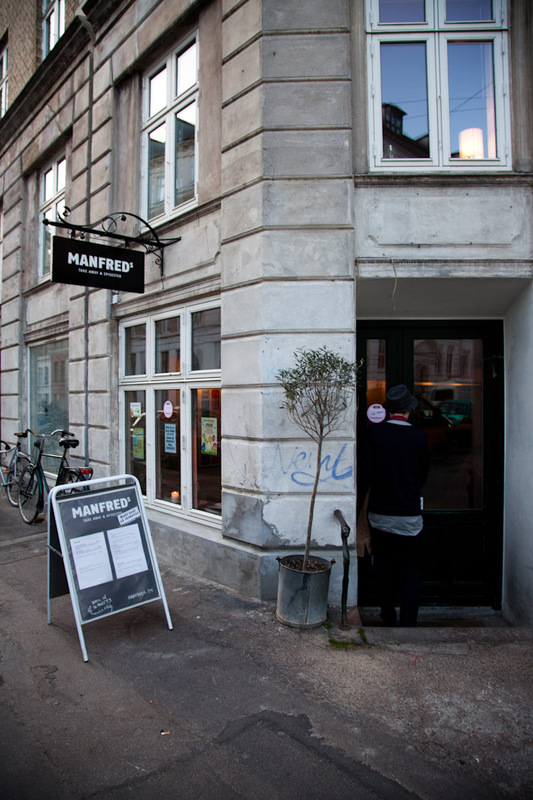 For our first night we were off to Manfred’s, opened by former Noma sous-chef Christian F. Puglisi. 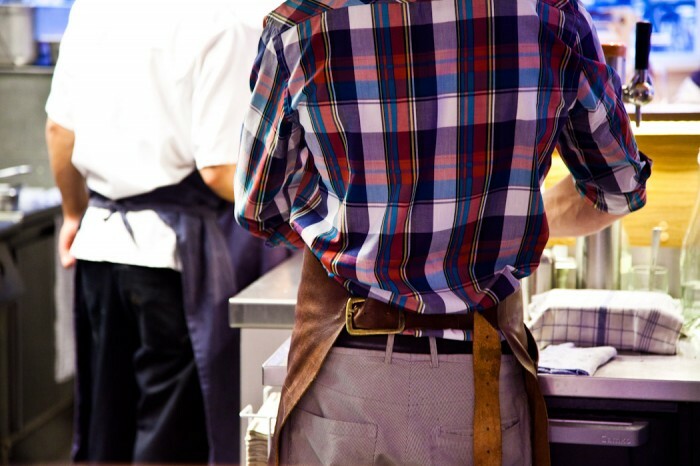 During the day it is a gourmet take-away, and at night it becomes a tiny special sit down restaurant offering the best of local and seasonal ingredients. If you can book in advance there is seriously limited seating available. 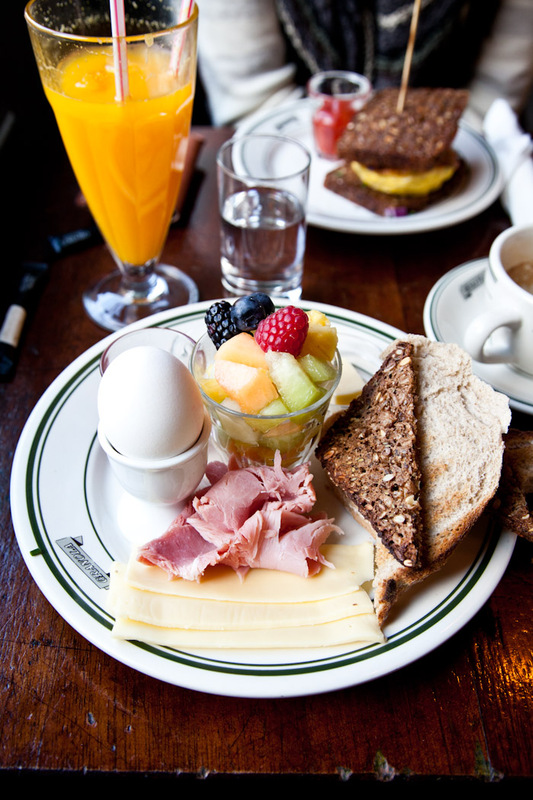 — brunch available on weekends. 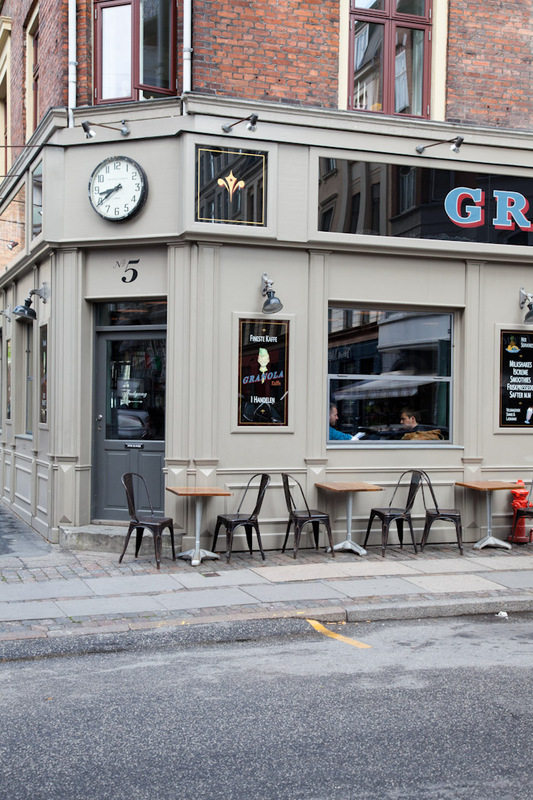 Pour over coffee, cheap red wine, or 40 kroner Carlsberg. 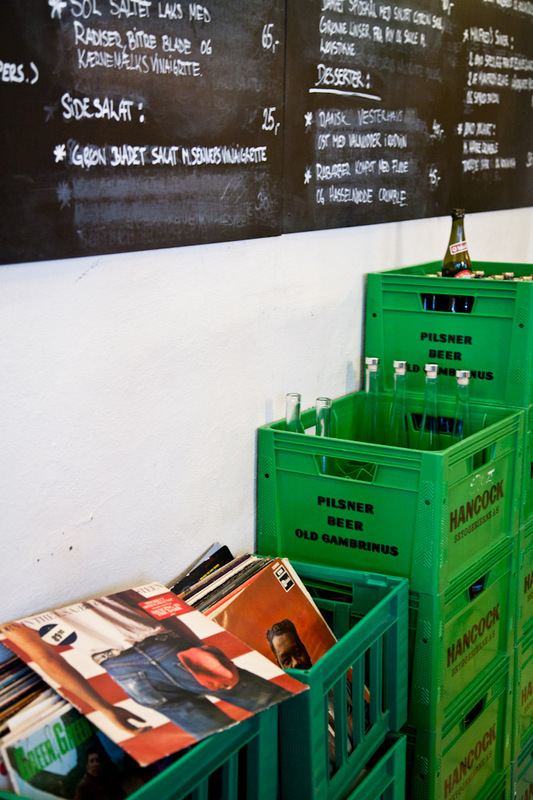 They have a record player in the corner and tons of vinyl, they keep it going until close without skipping a beat. 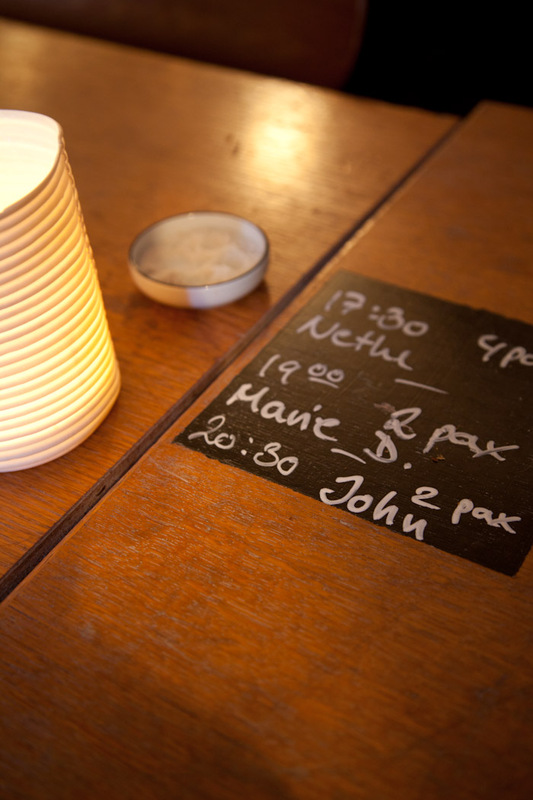 Our table had a little chalkboard paint on it to label the reservations. 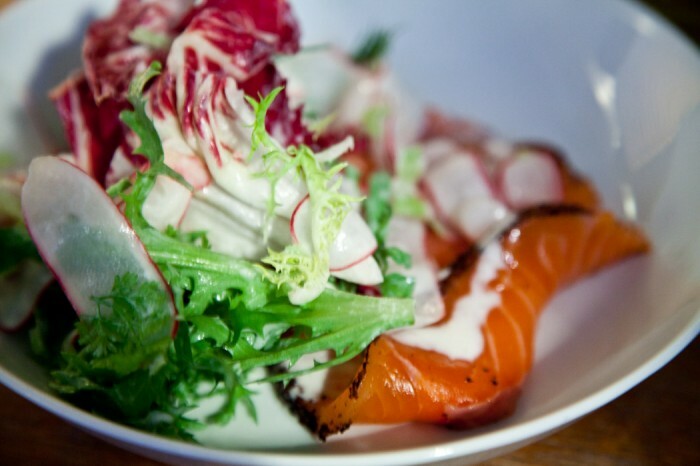 As an appetizer, Juli had the fresh salmon with buttermilk. 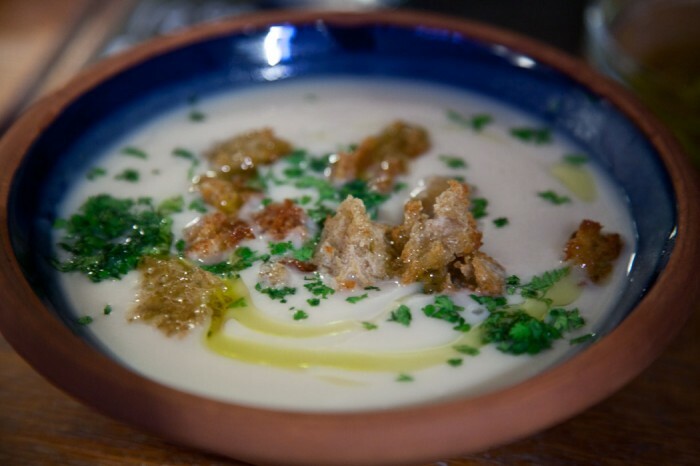 I had the creamy cauliflower soup with crunchy croutons, so delicious. 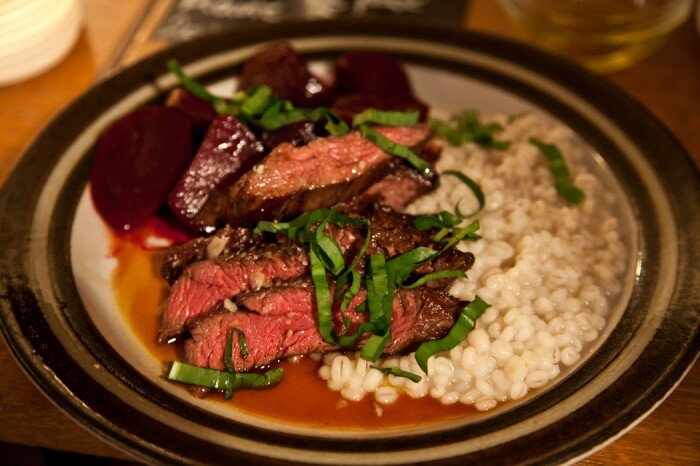 Our main was ox tail, roasted beet, and bulgar. It was a great combination and a wonderful meal, we had to waddle back to our hotel. Hello! 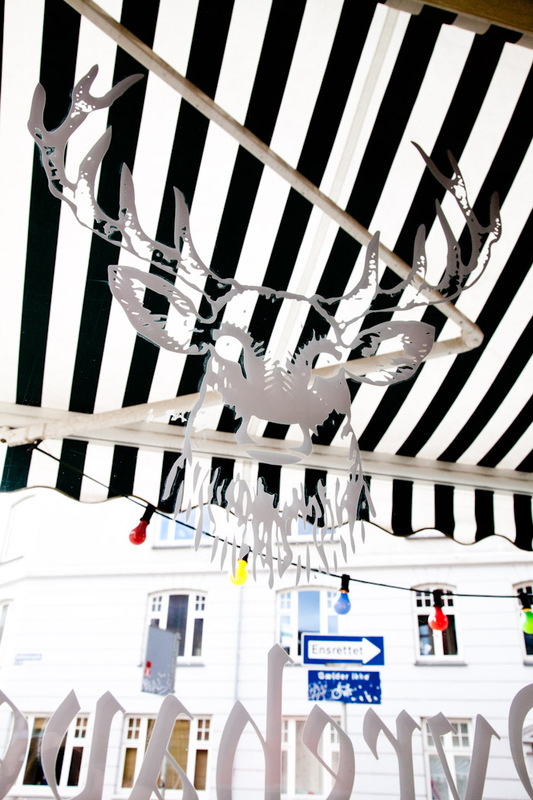 We are happy to report that the Mjolk website is back online! It’s a miracle! In a few weeks time we will be launching our new website with one-click shopping. Thank you for your continued patience as we get through this technically challenged time. 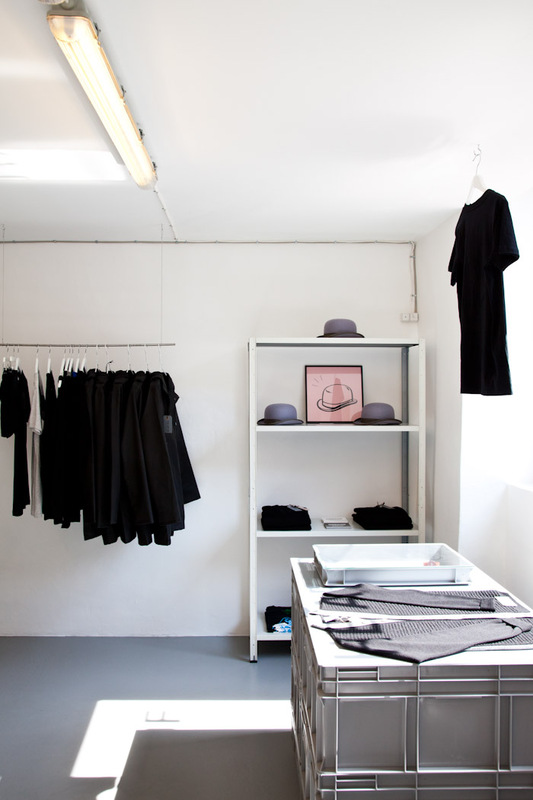 Our buying trip is going great…we are bringing back some goodies which will be the shop THIS WEEKEND! See you soon, we miss you!